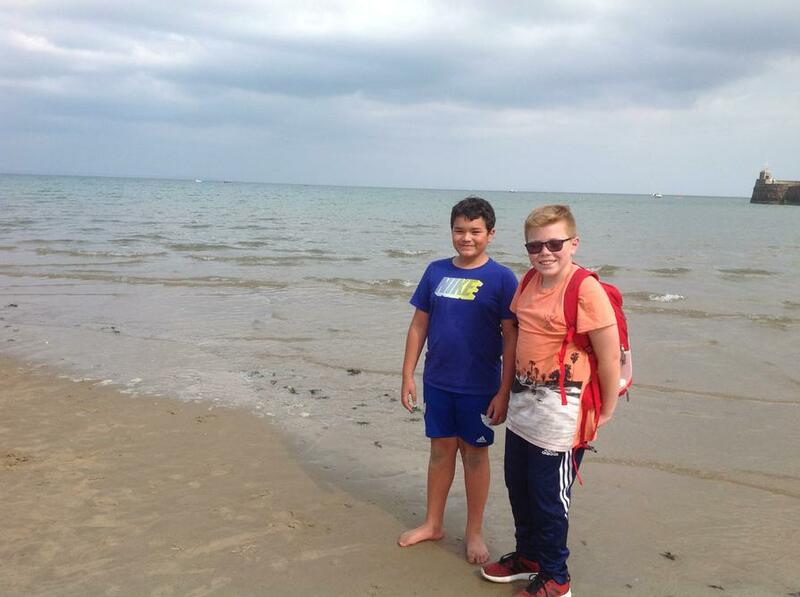 Superb weather greeted us again today for the second day of the residential trip. 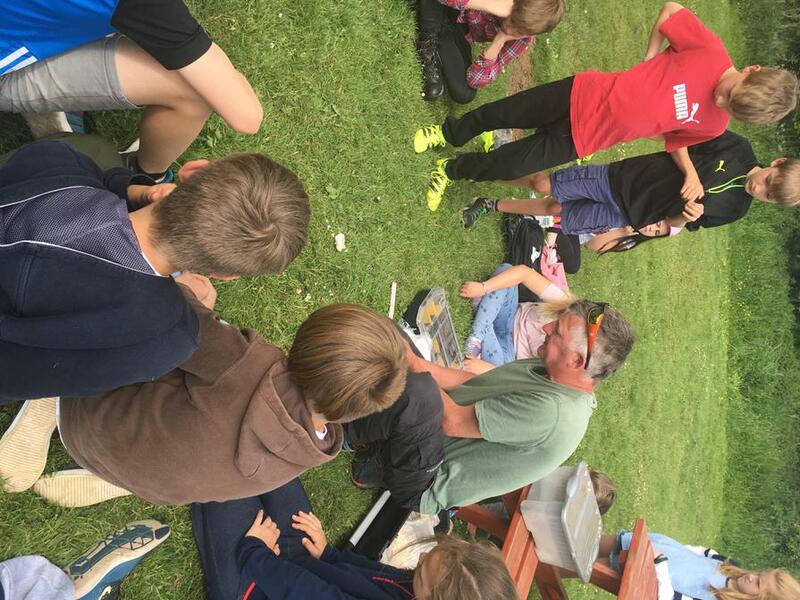 At 8 o'clock we started with breakfast and the children had a splendid range of choices including cereal, toast, bacon, sausages, beans, pain au chocolat, croissants and more. 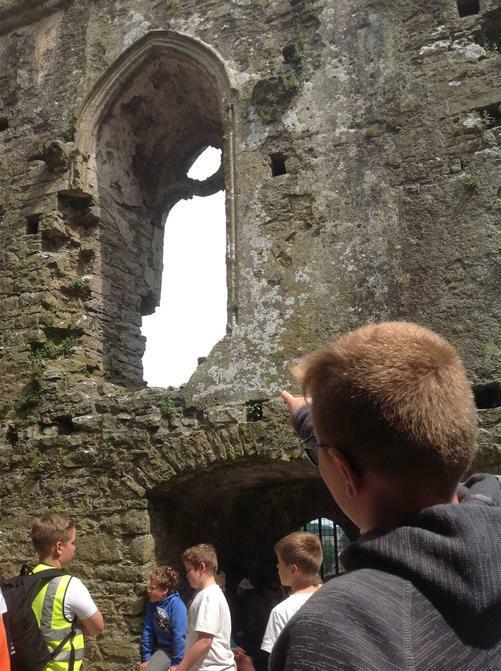 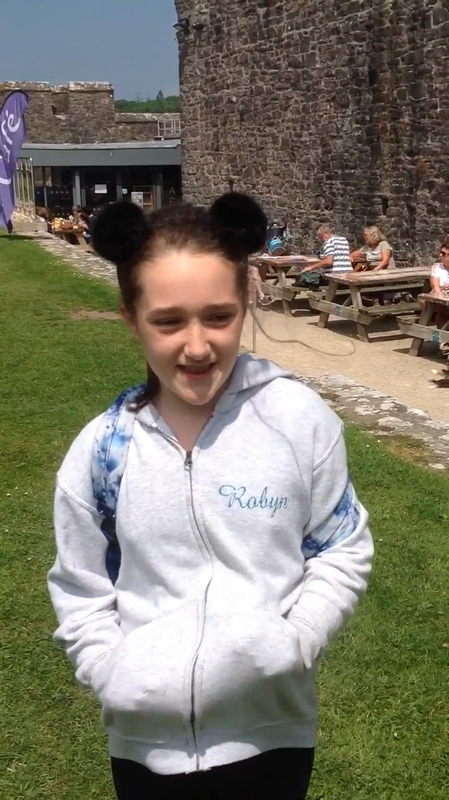 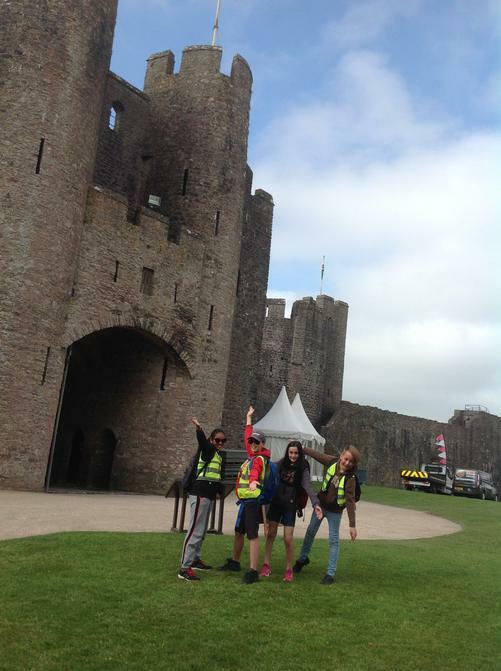 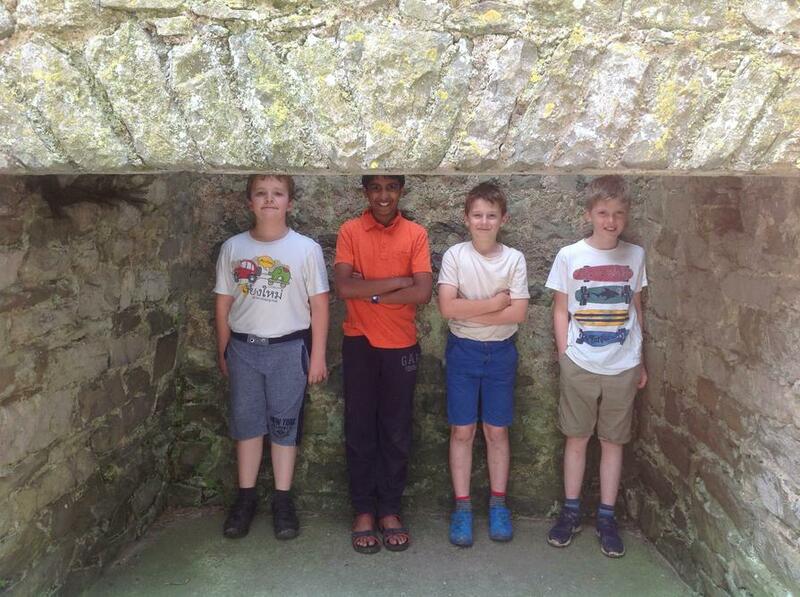 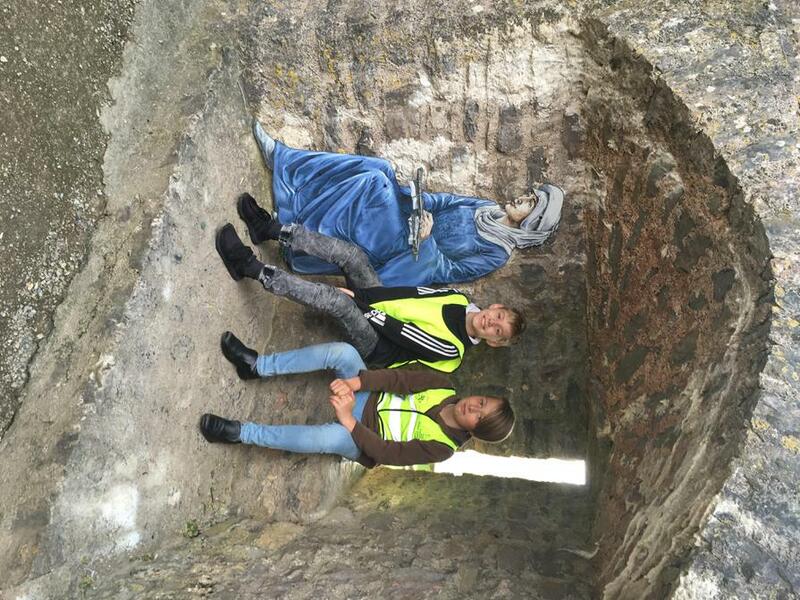 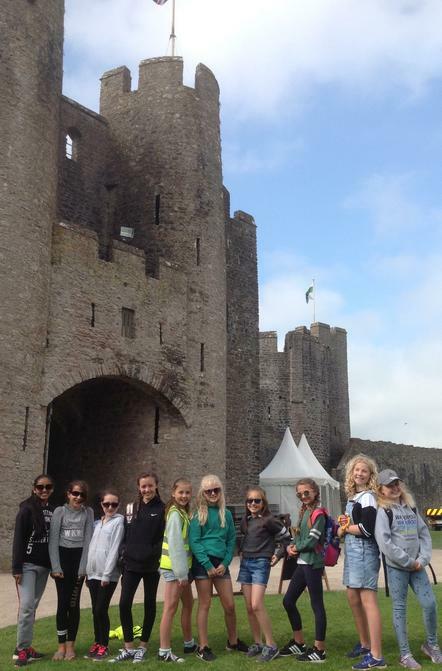 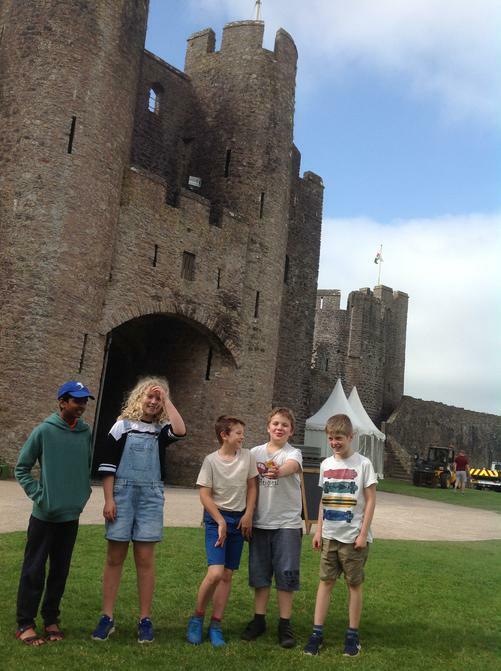 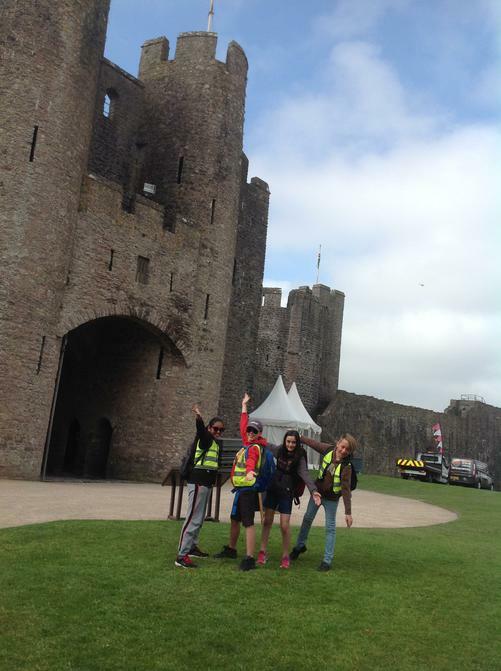 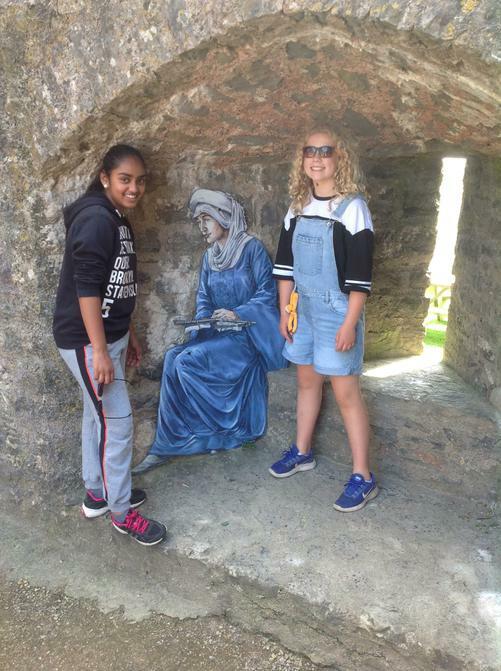 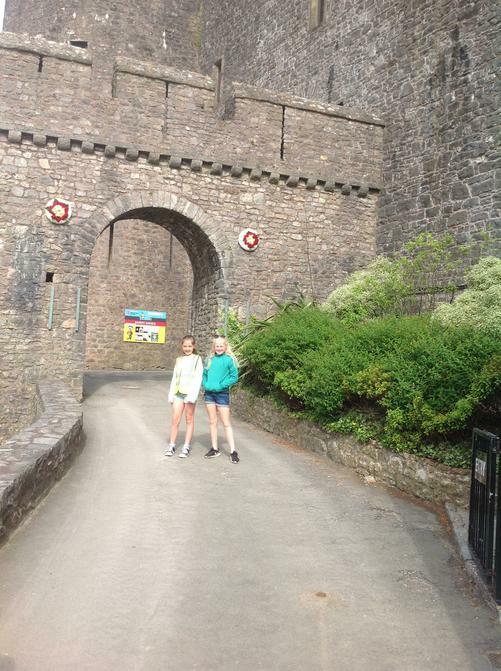 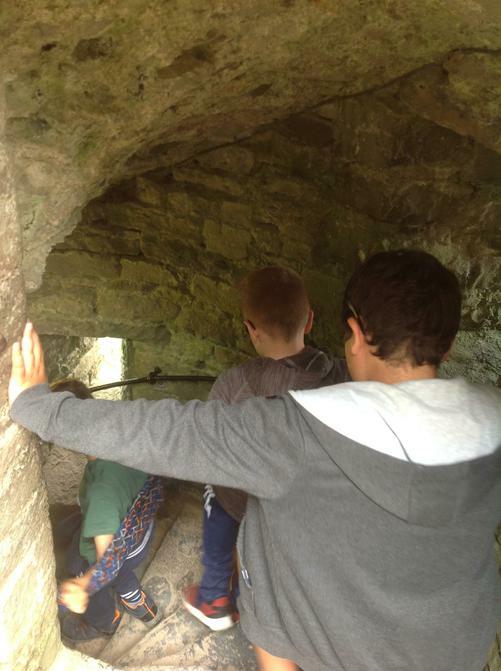 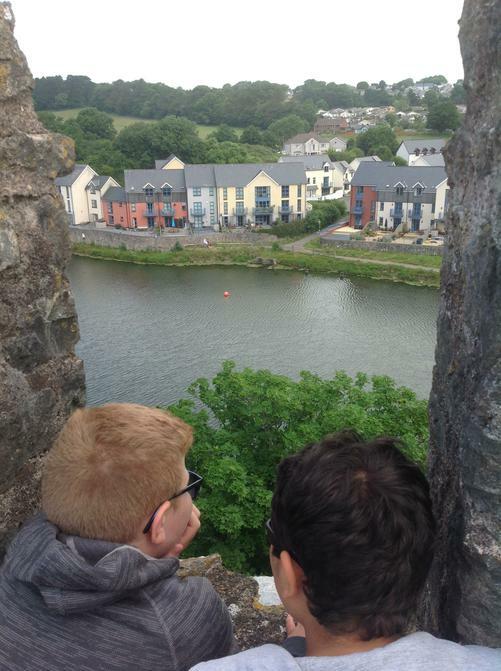 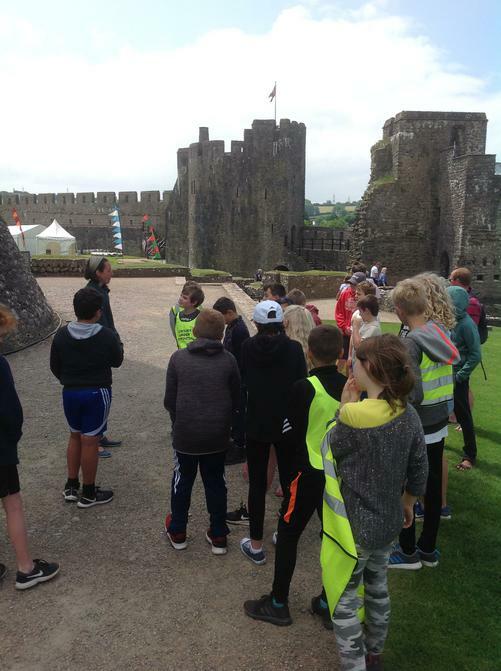 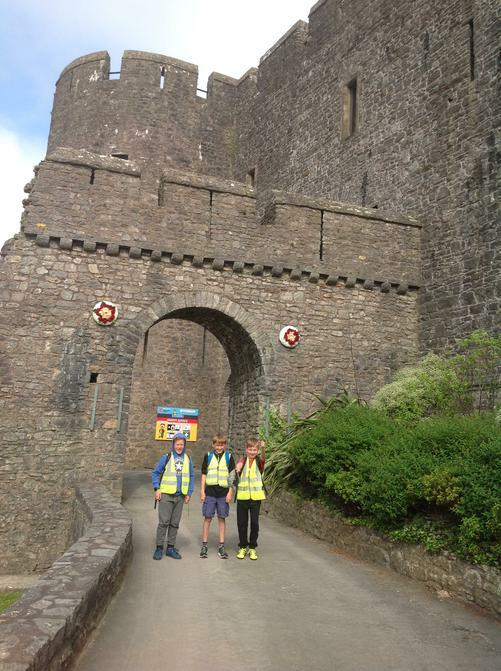 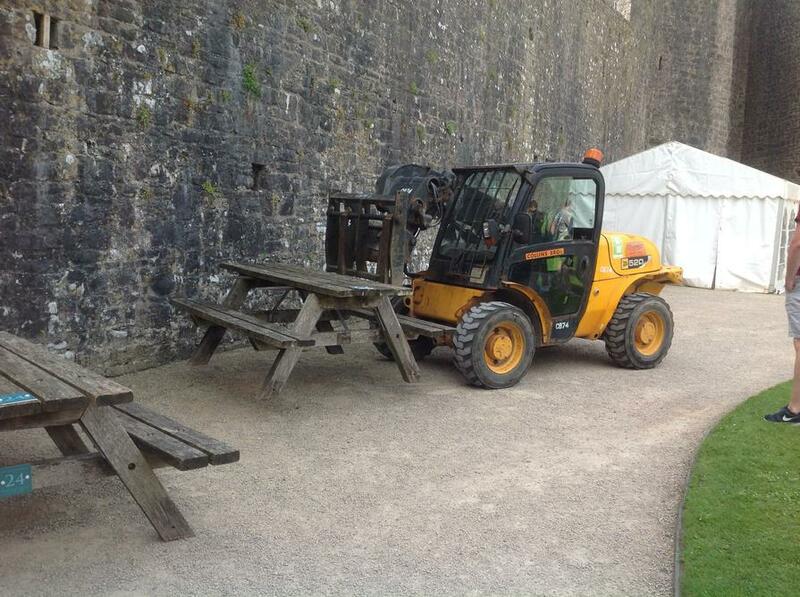 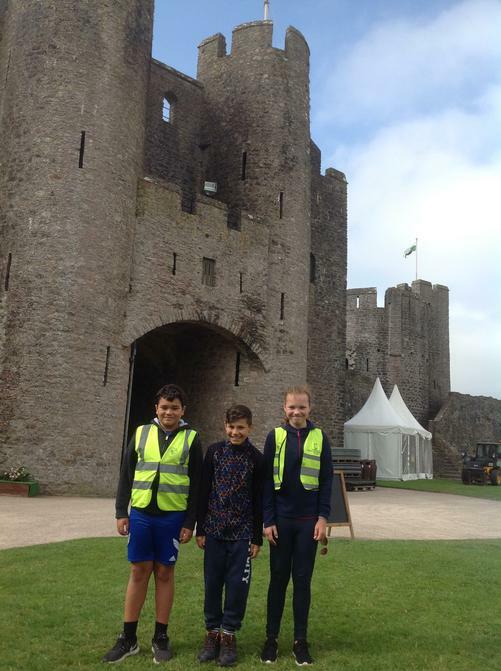 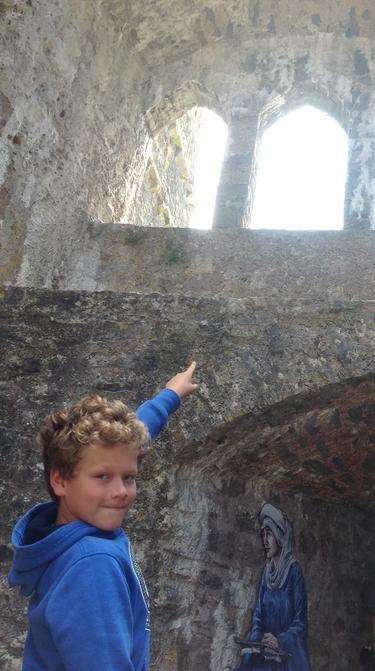 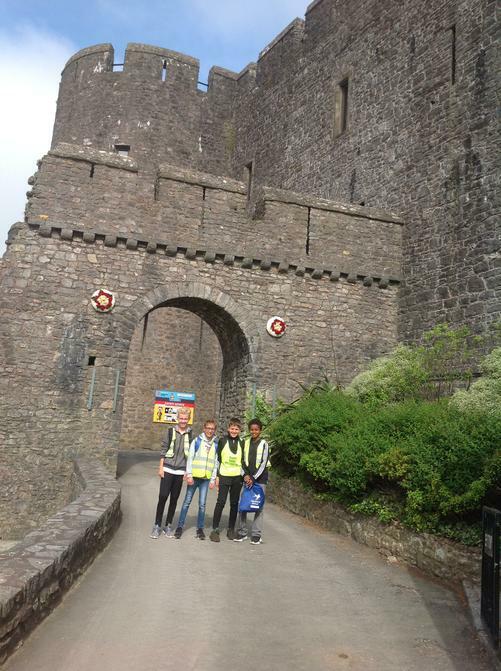 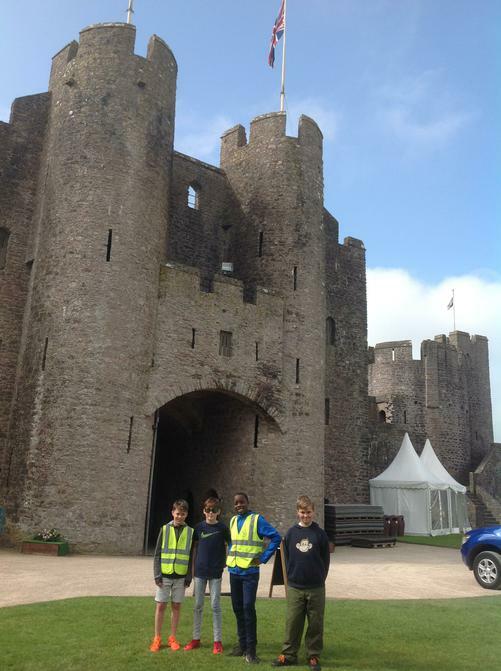 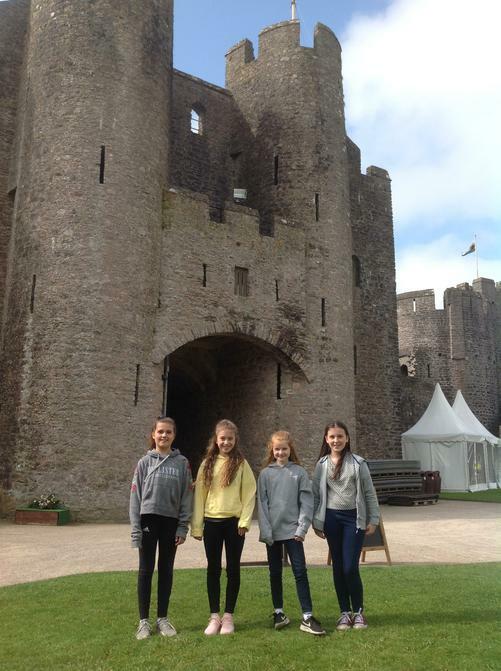 Then we headed off to Pembrokeshire Castle. 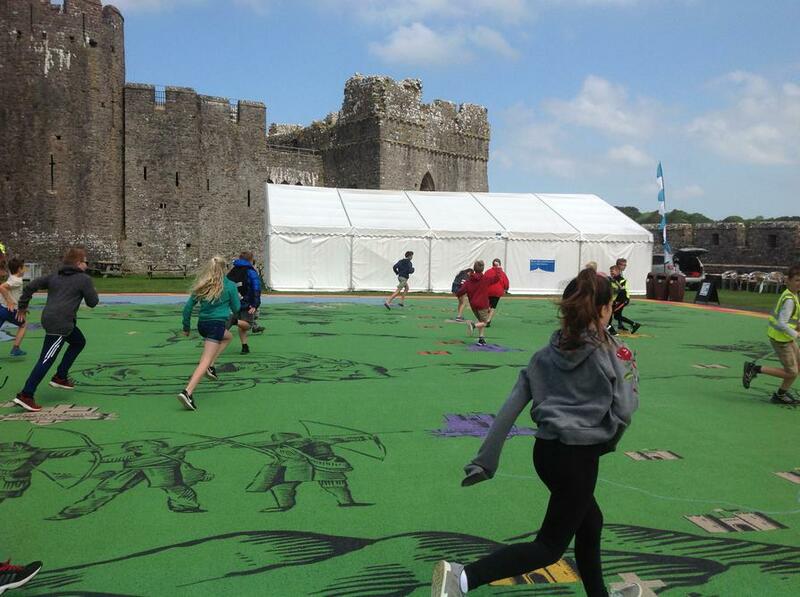 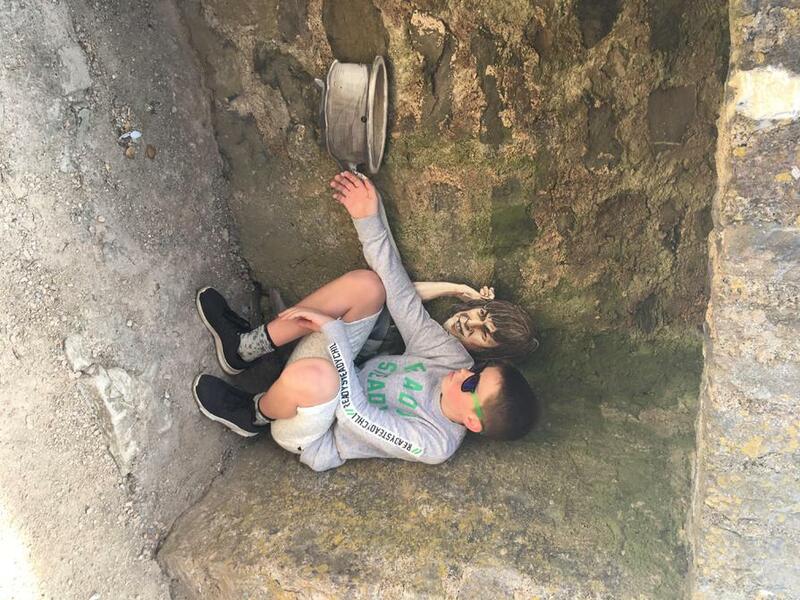 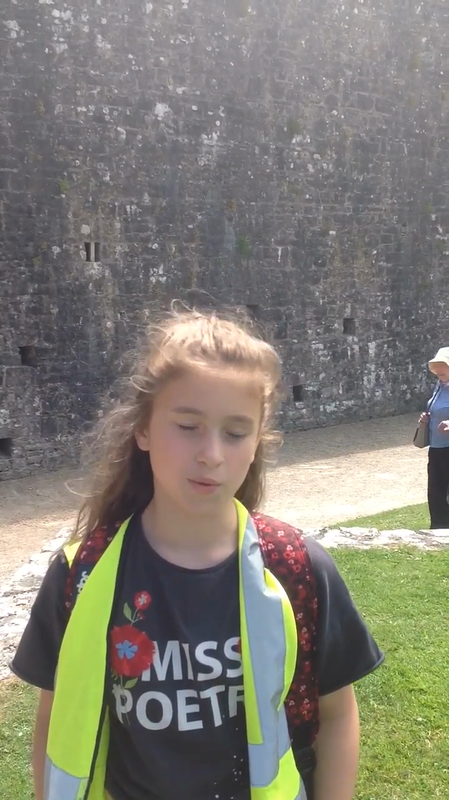 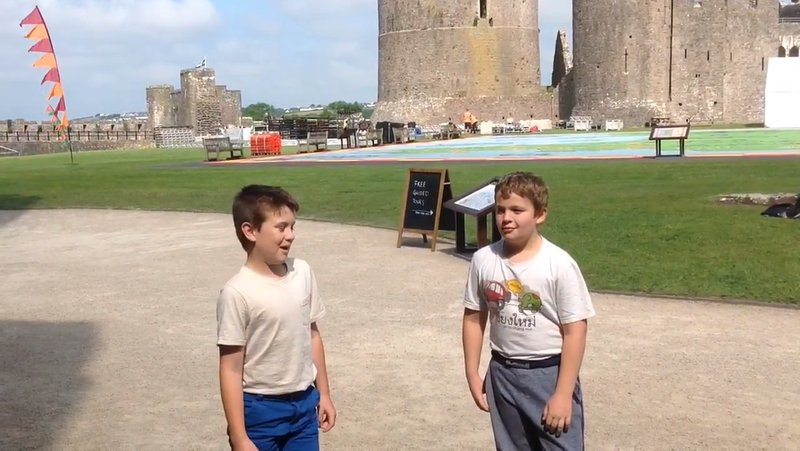 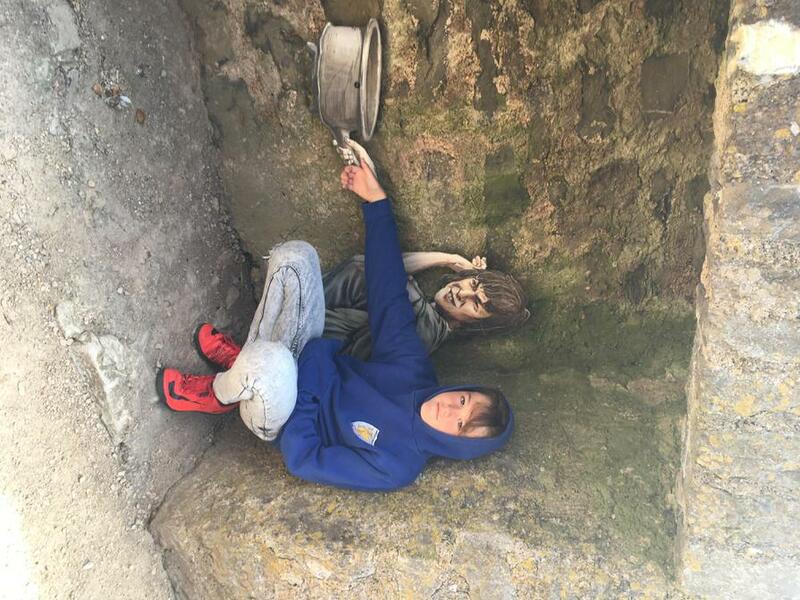 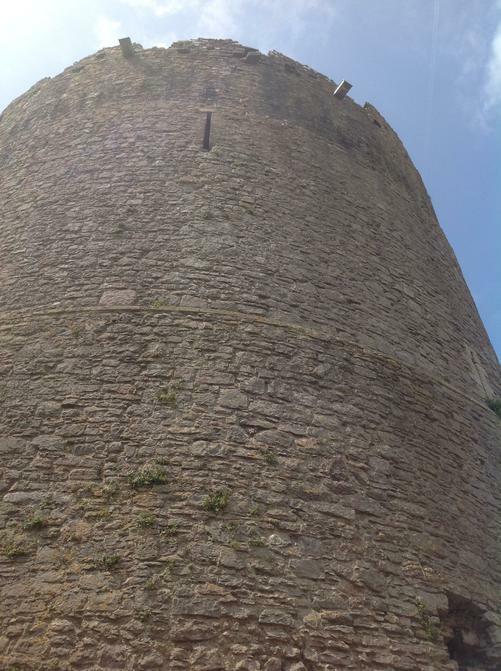 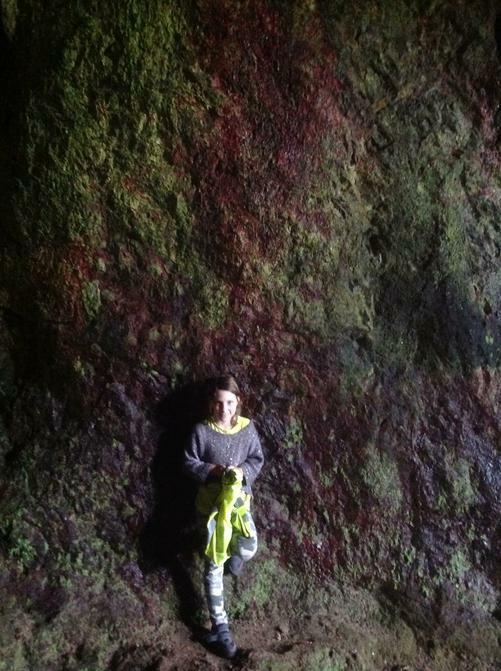 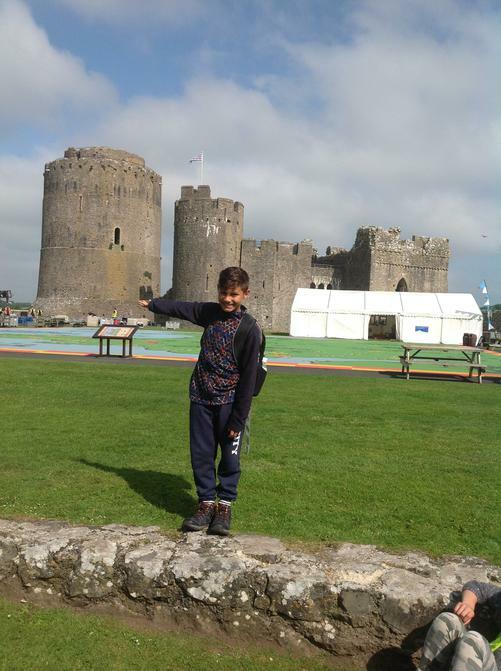 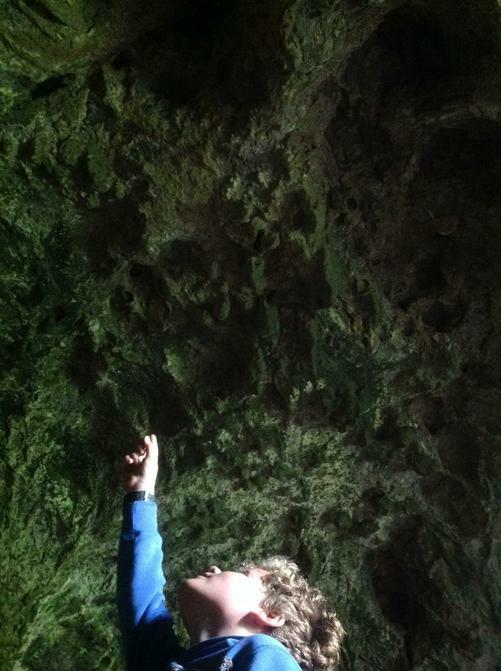 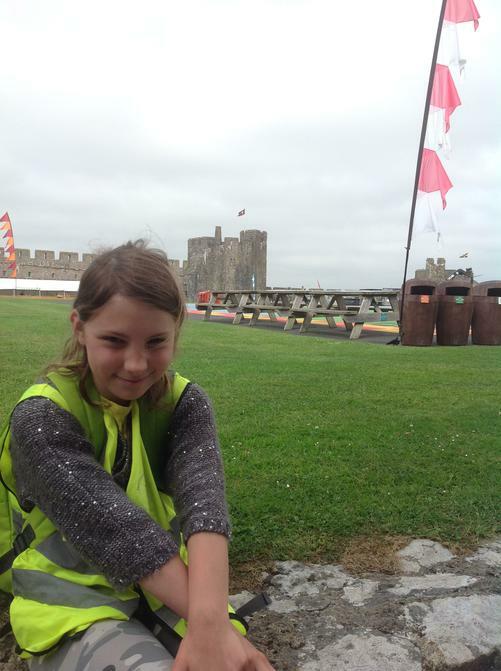 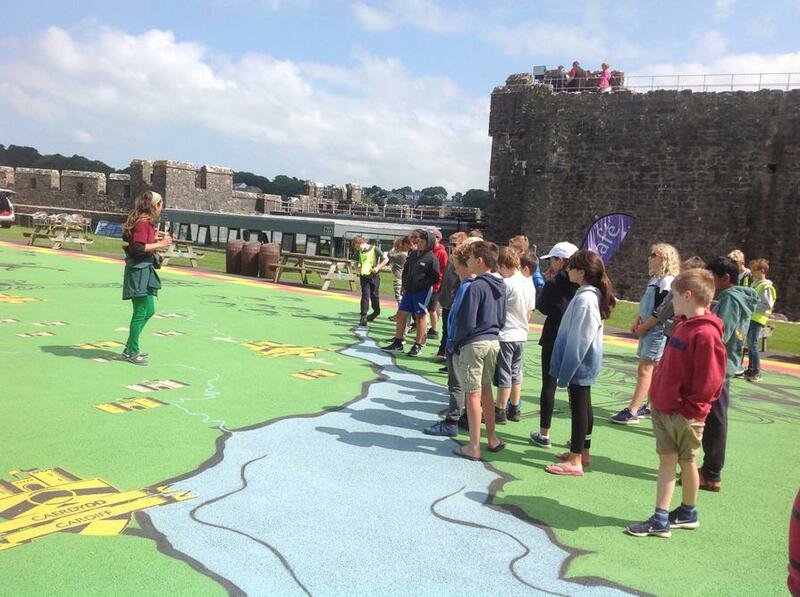 Some of the highlights of the castle included finding out the origins of gunpowder, the fate of mediaeval prisoners, seeing the stalgatites, the large windows but small arrowslits, the Flemish-designed chimneys, the largest map of Wales in existence and the enormous Wogan cavern with its green walls tinted red by minerals in the water. 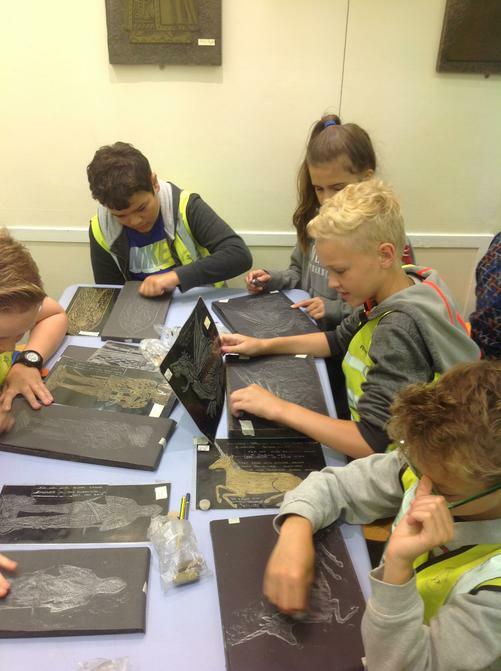 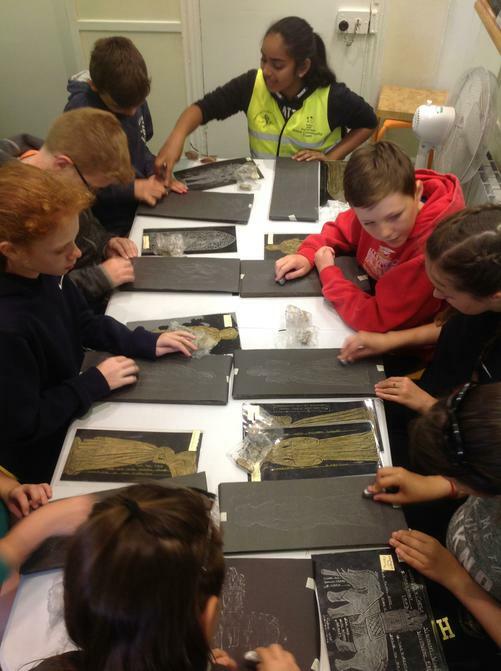 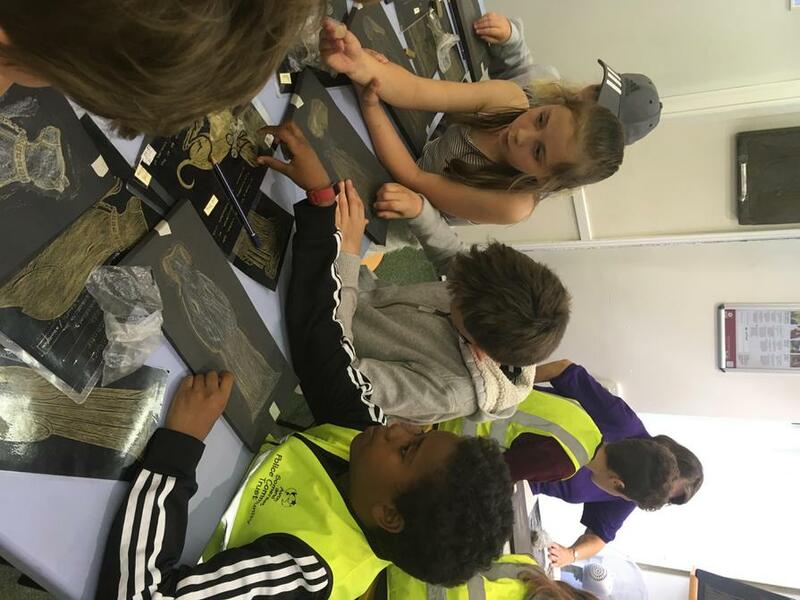 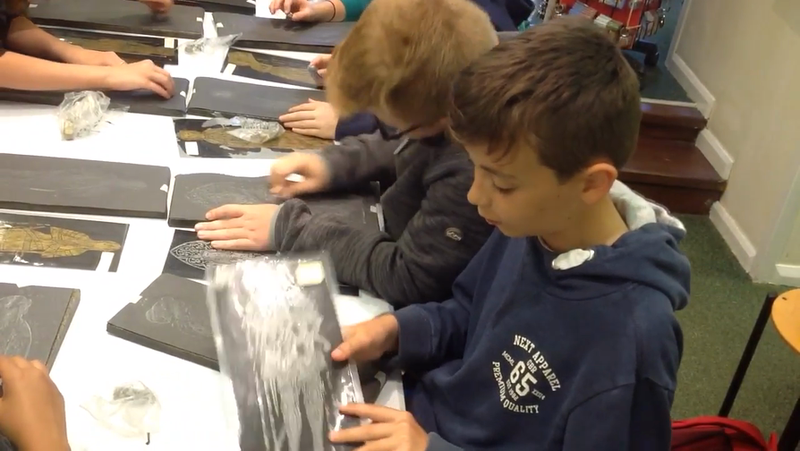 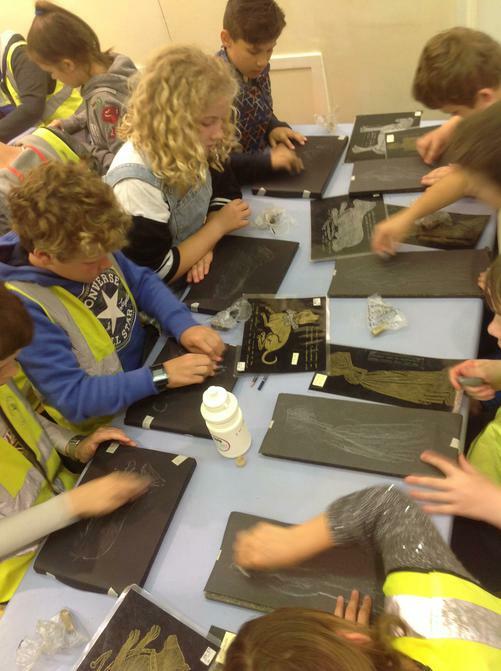 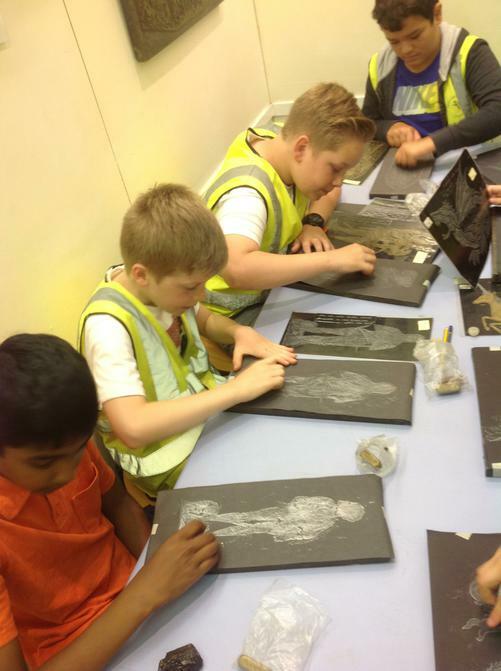 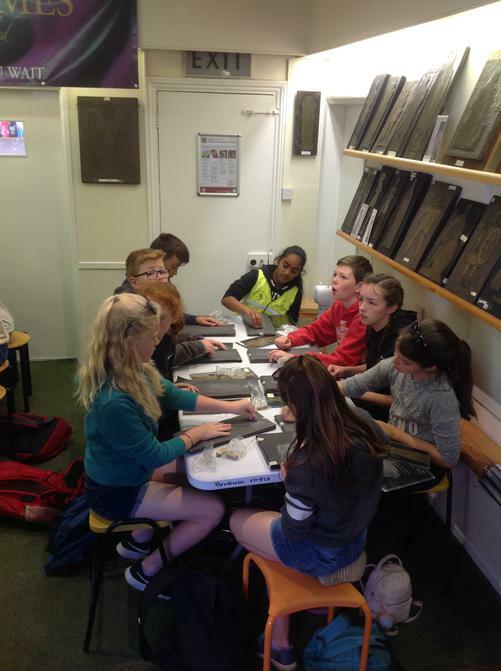 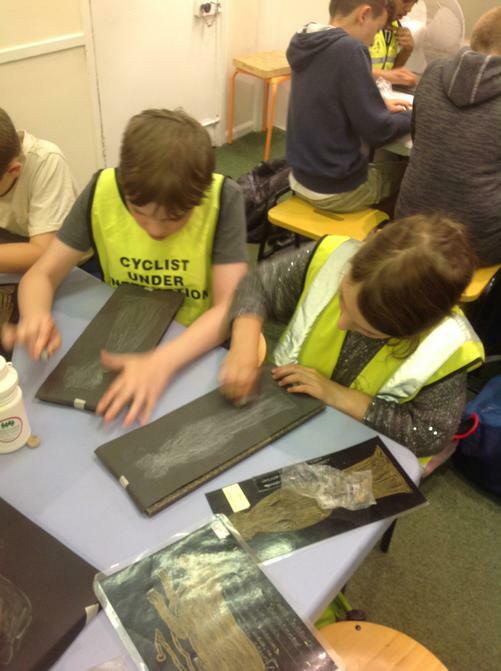 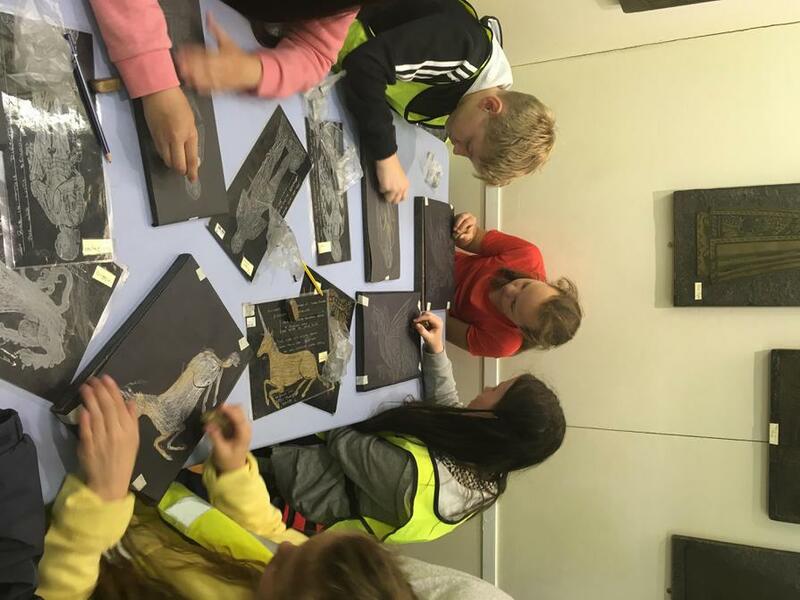 We also completed a brass rubbings activity and the children have created some artwork as a souvenir. 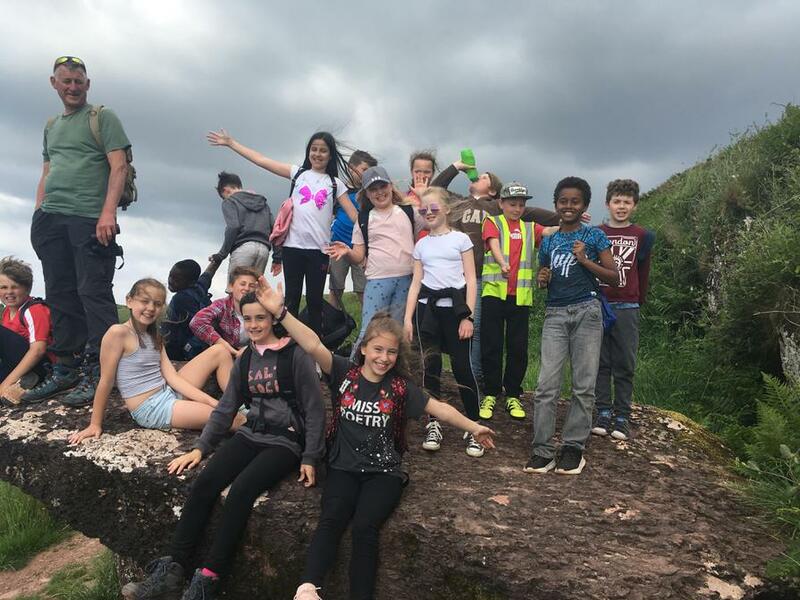 Back on the coach, we headed to different destinations. 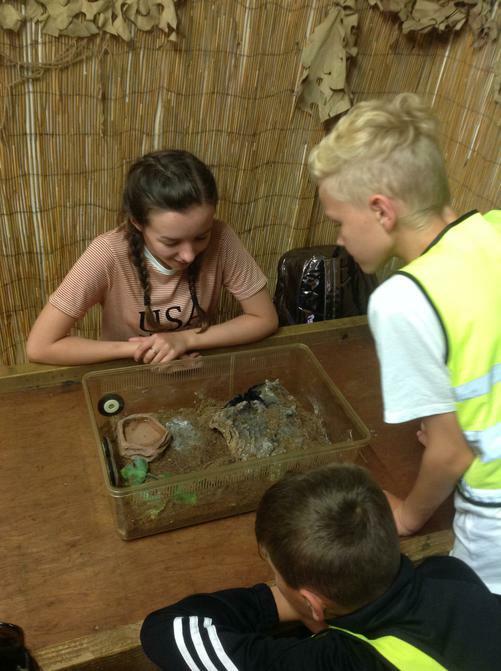 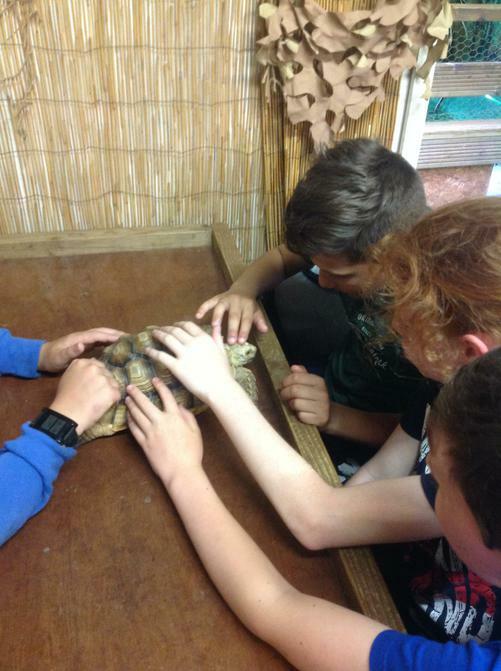 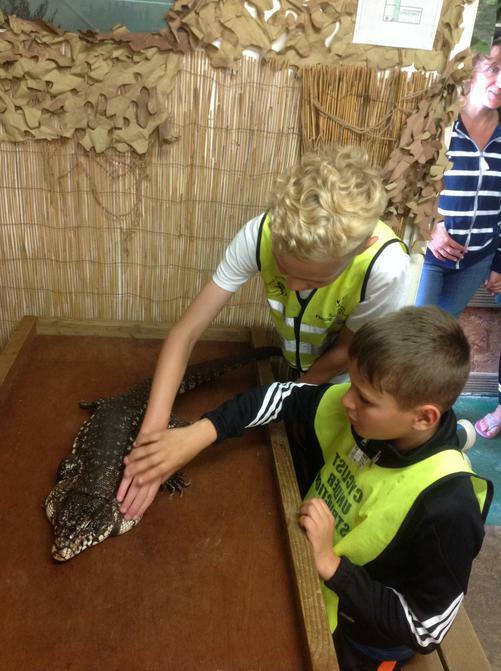 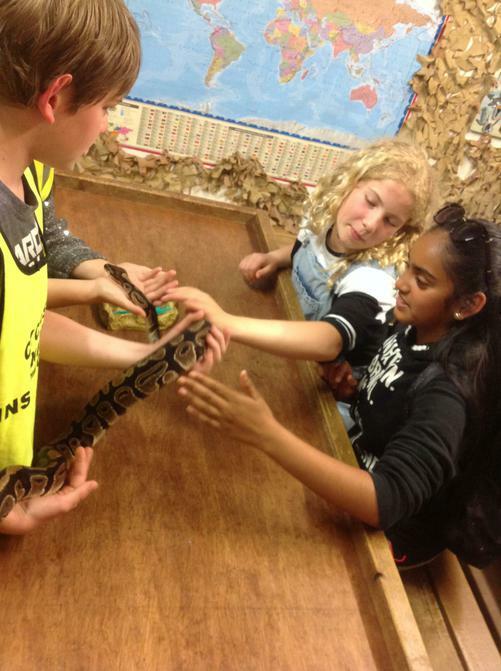 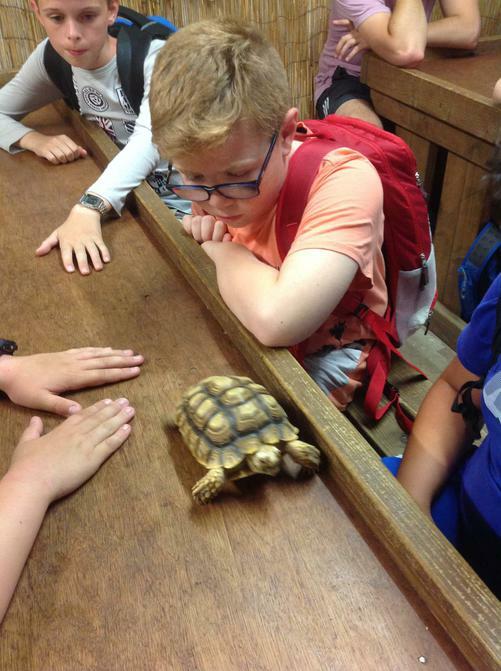 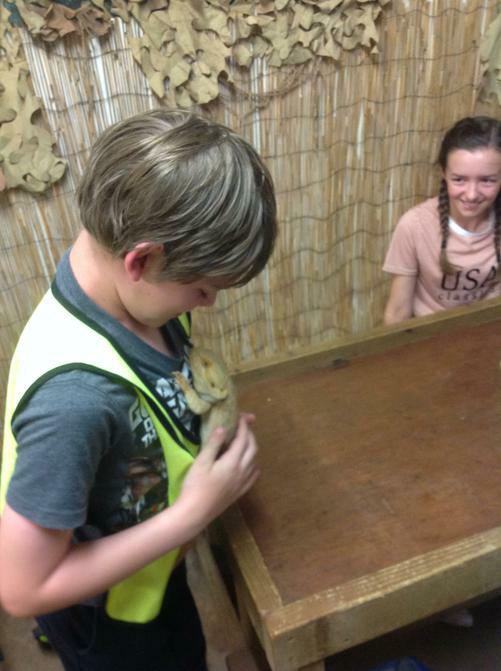 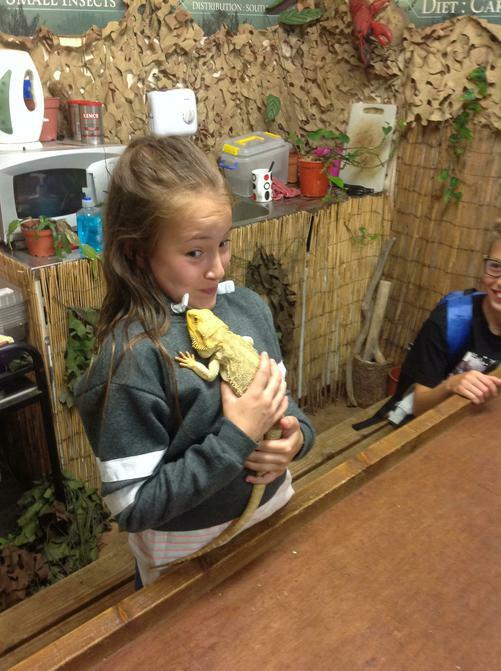 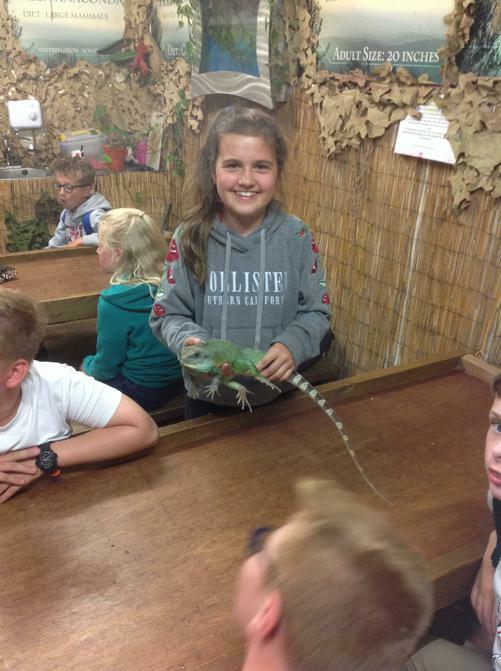 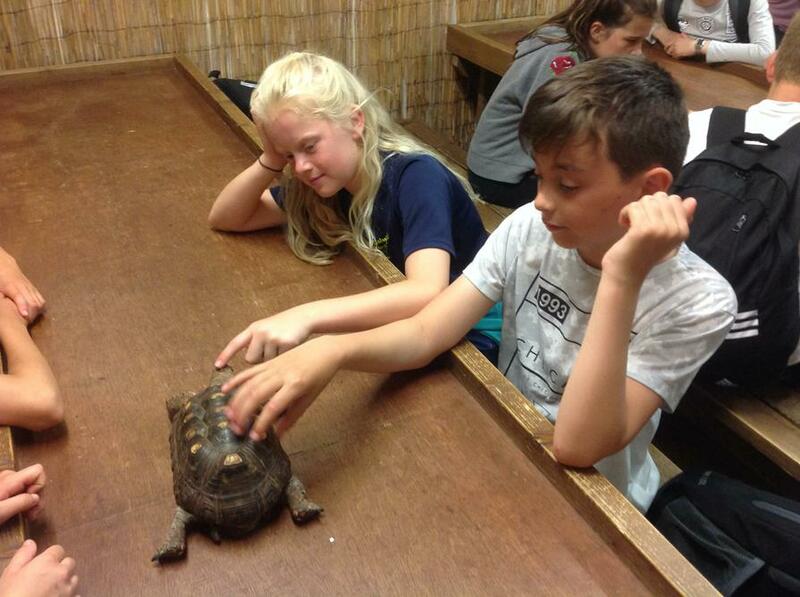 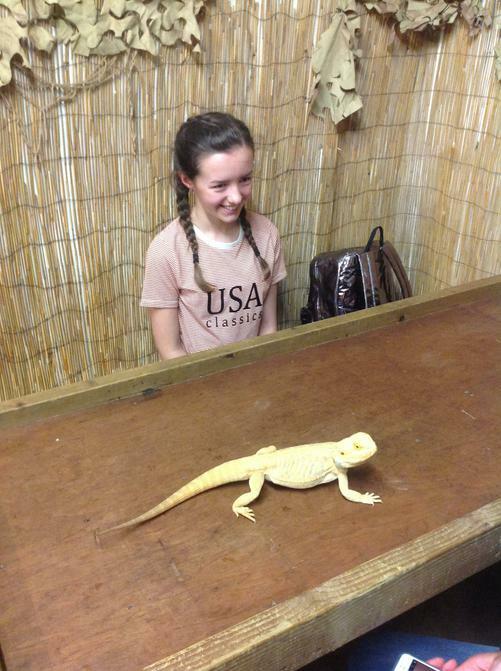 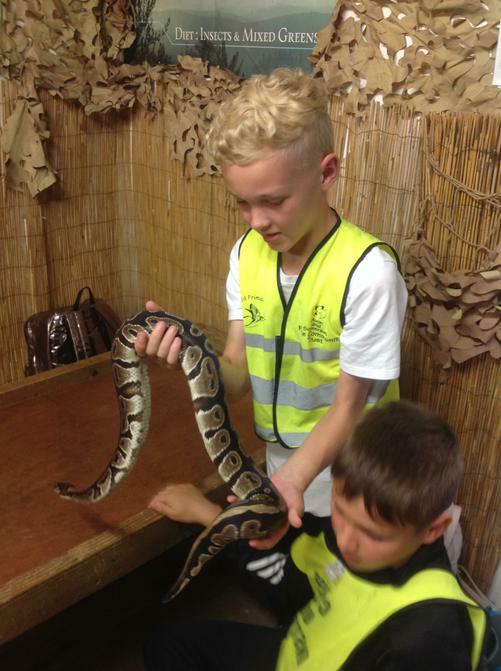 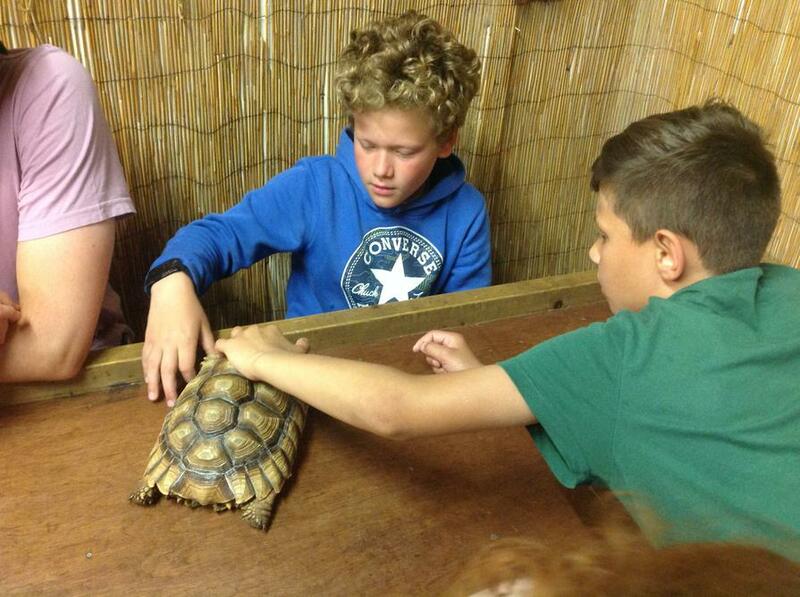 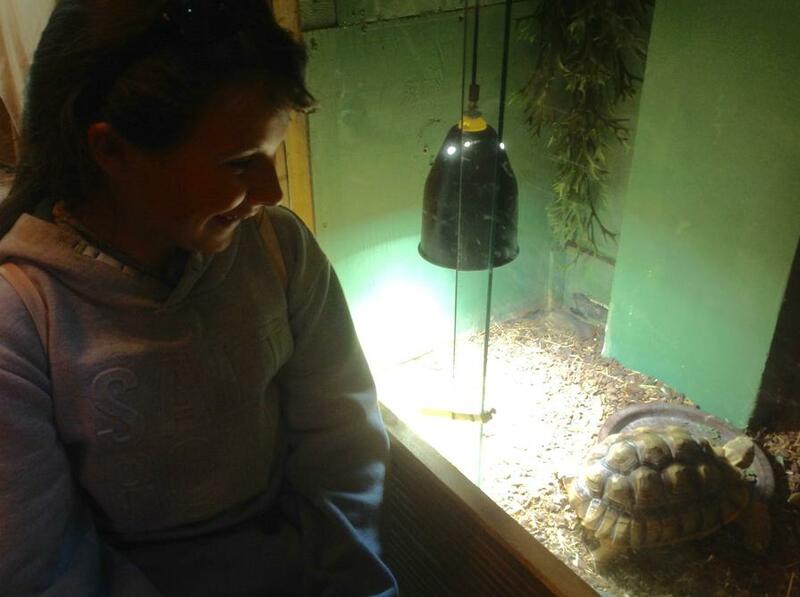 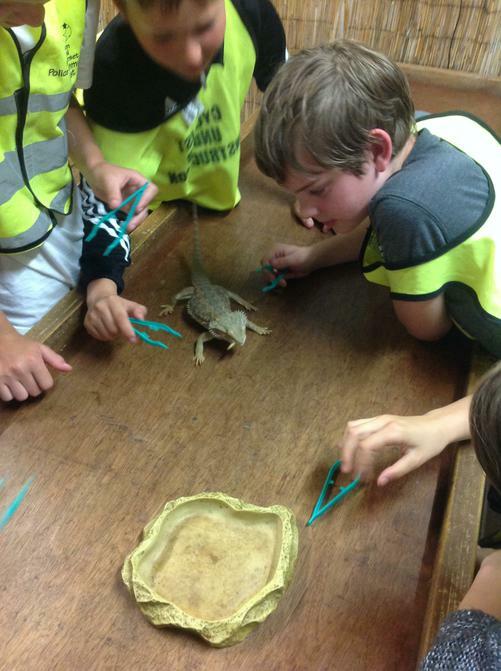 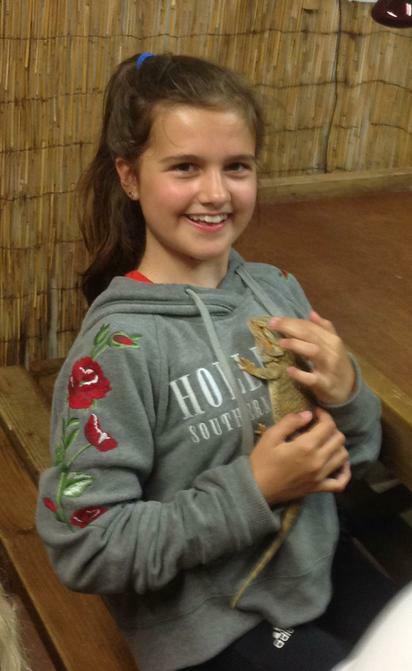 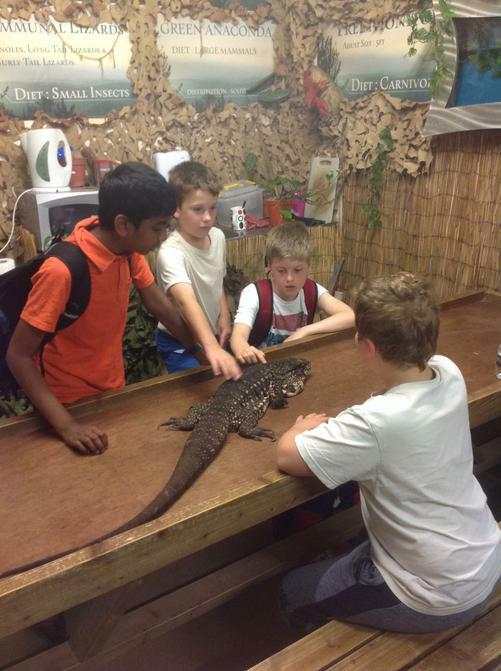 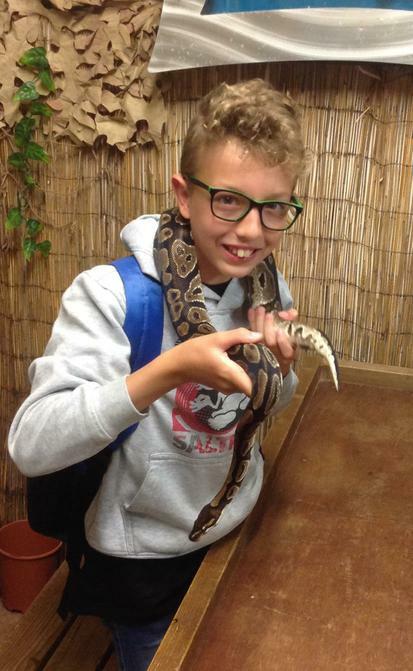 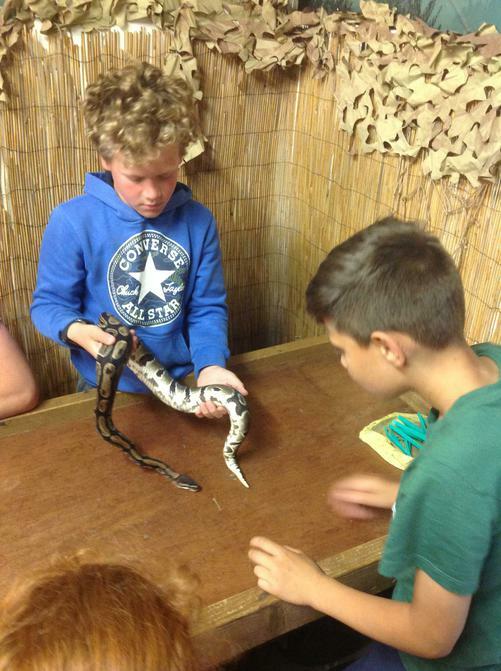 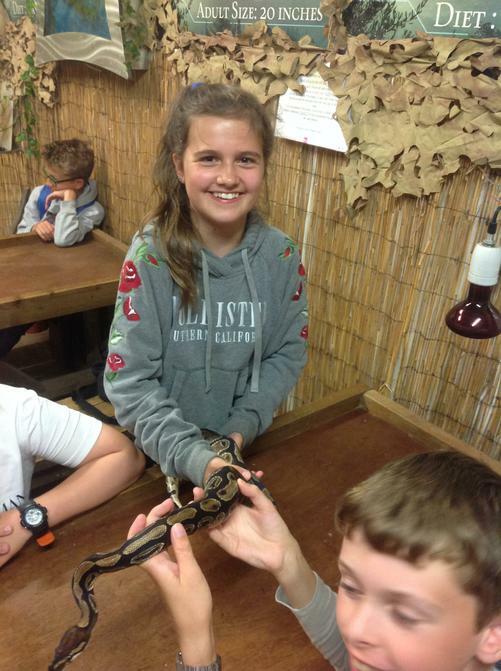 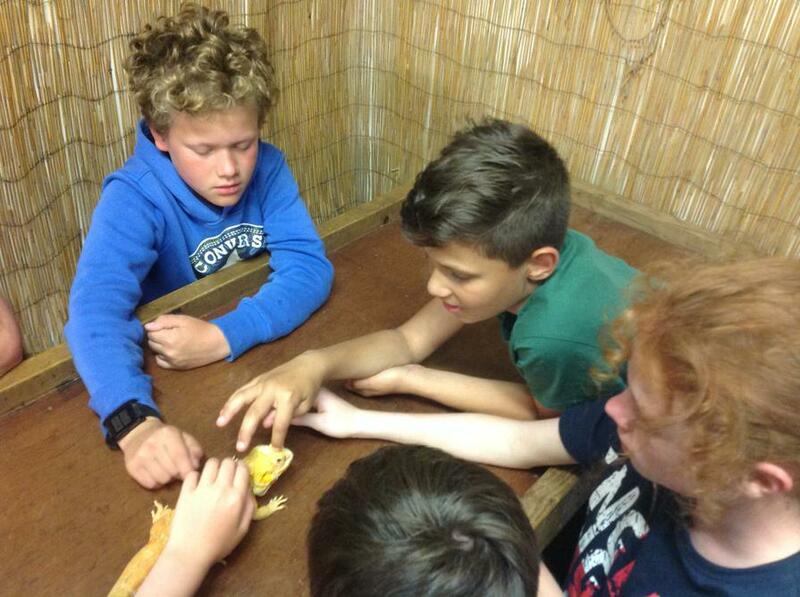 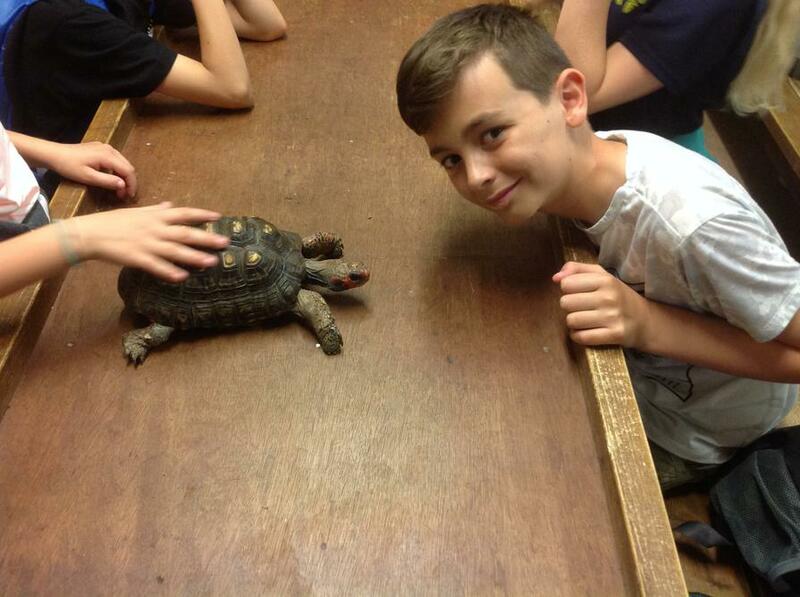 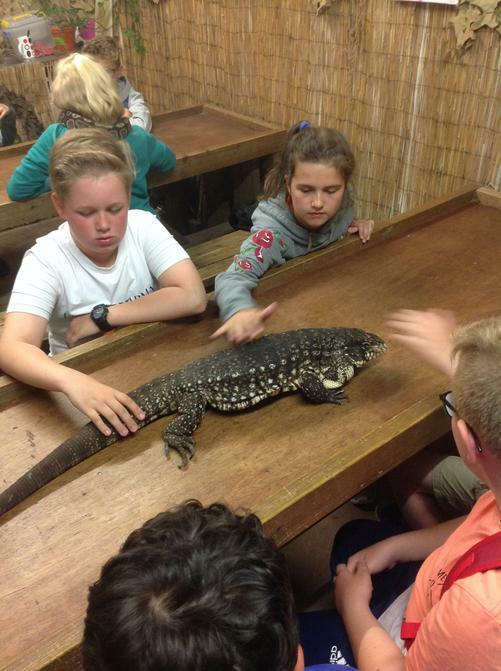 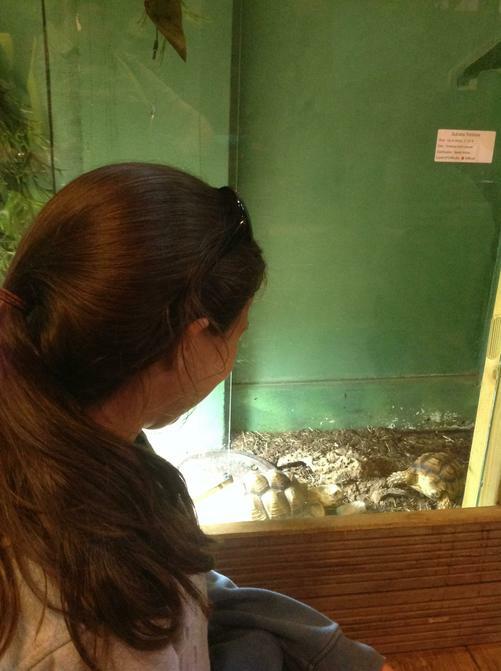 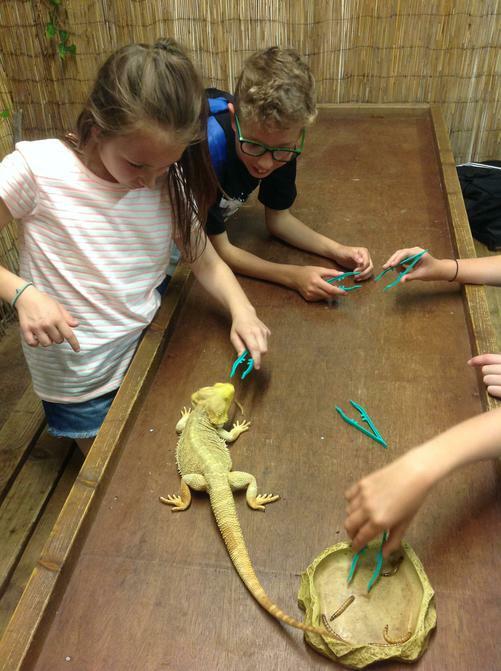 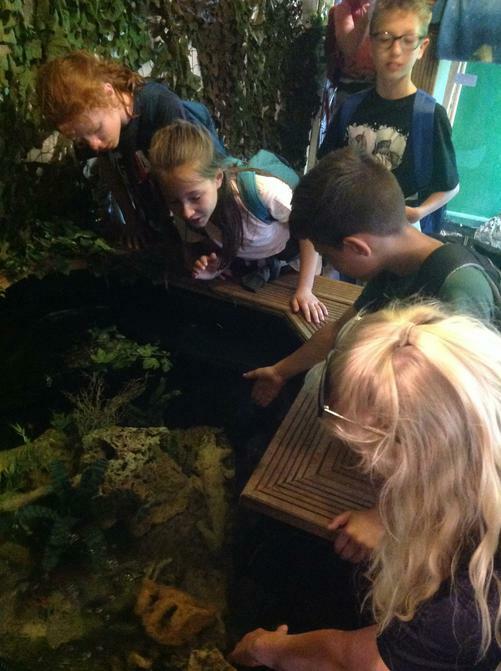 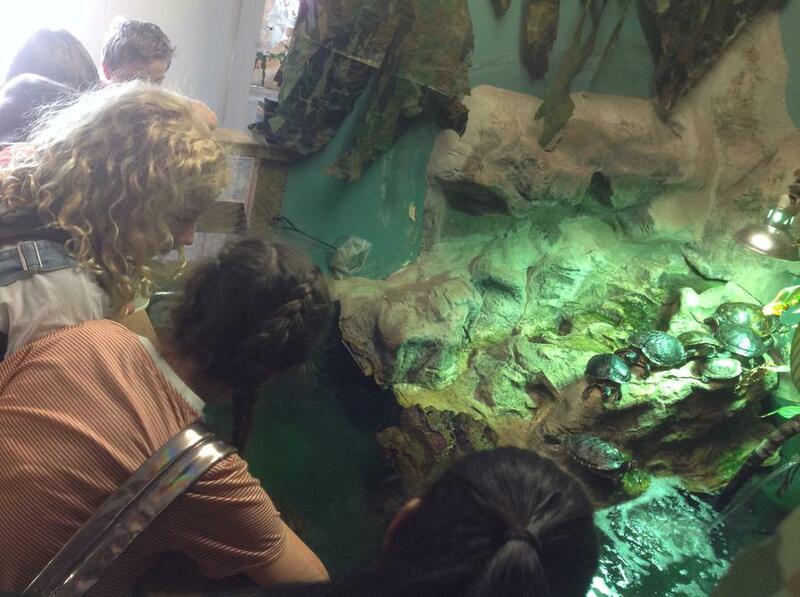 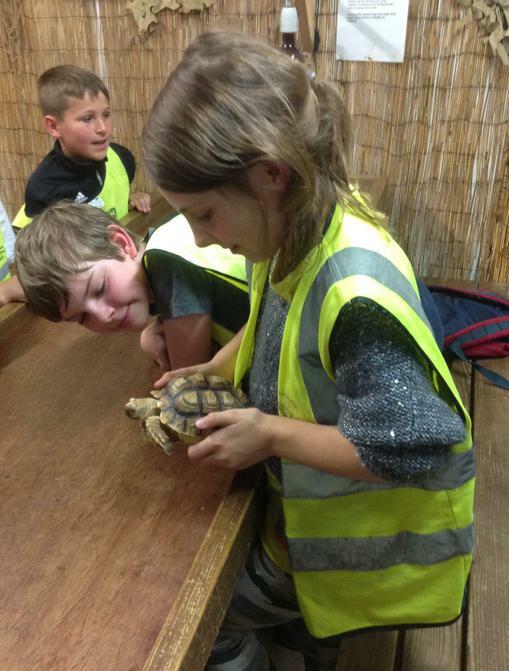 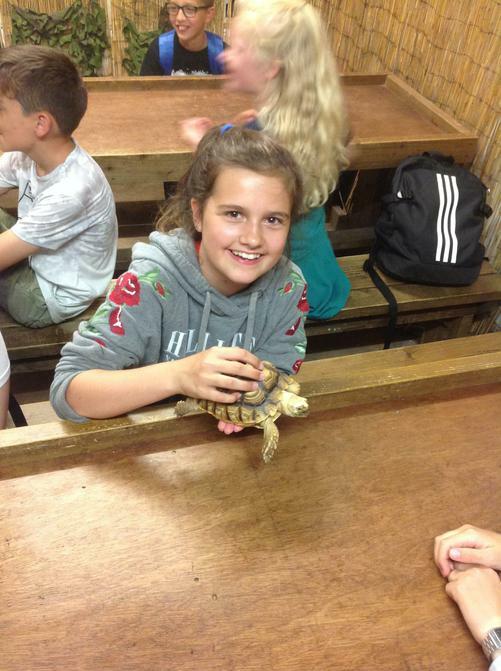 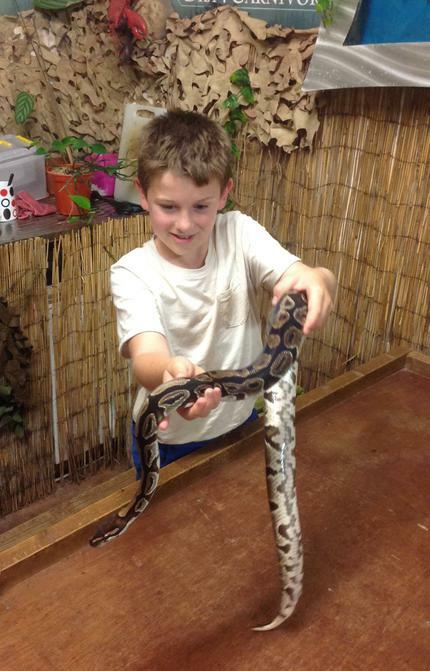 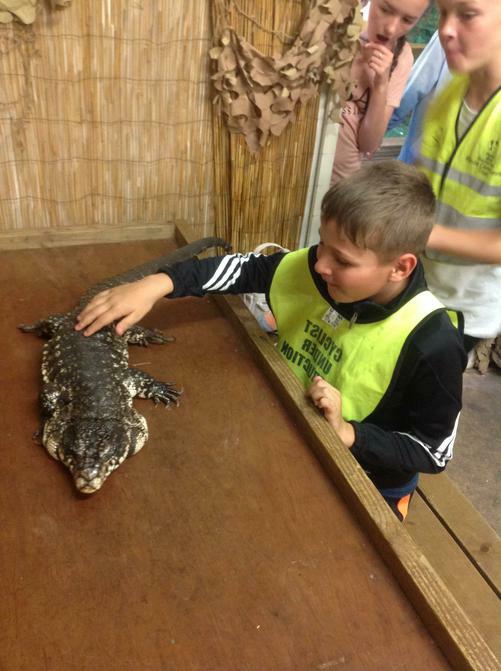 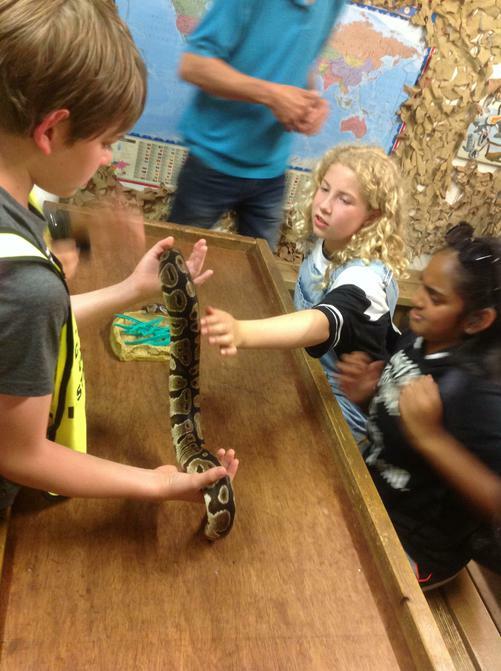 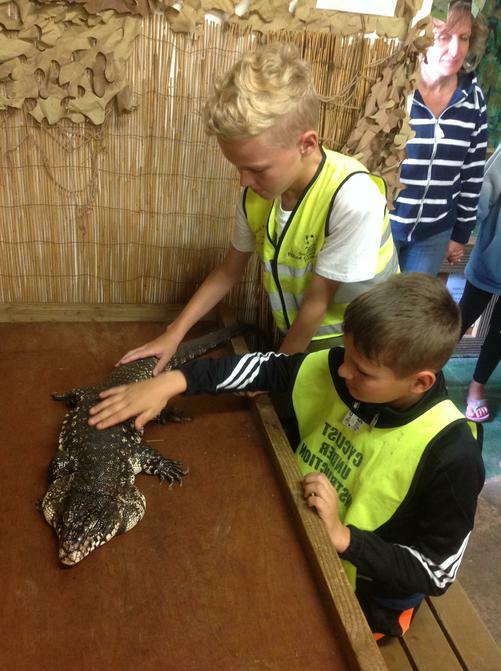 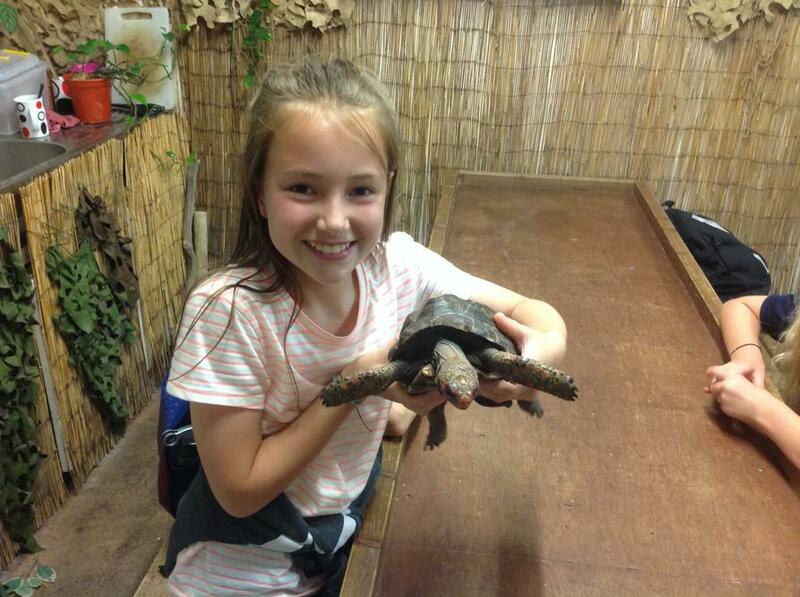 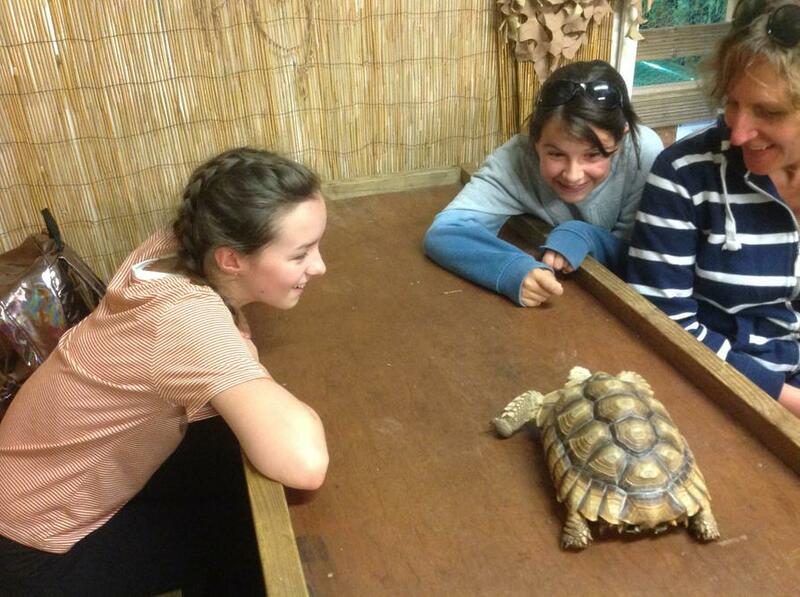 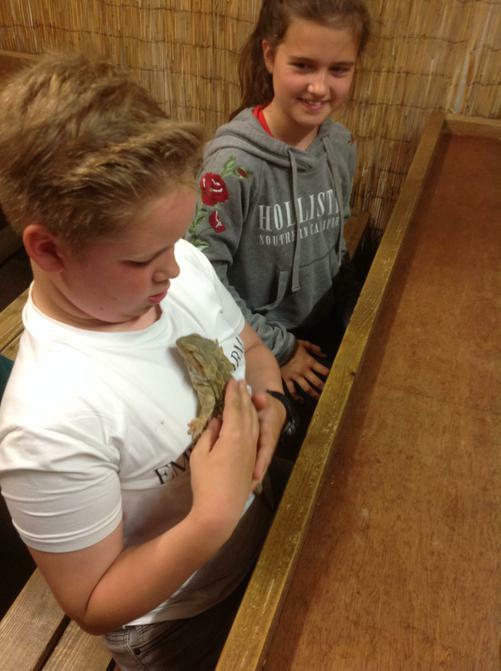 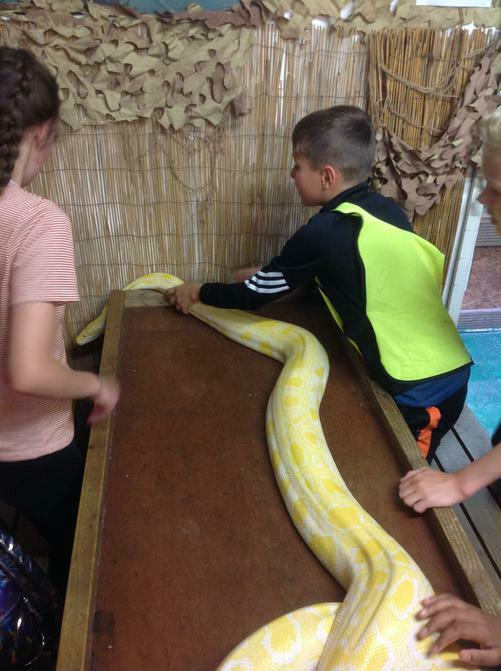 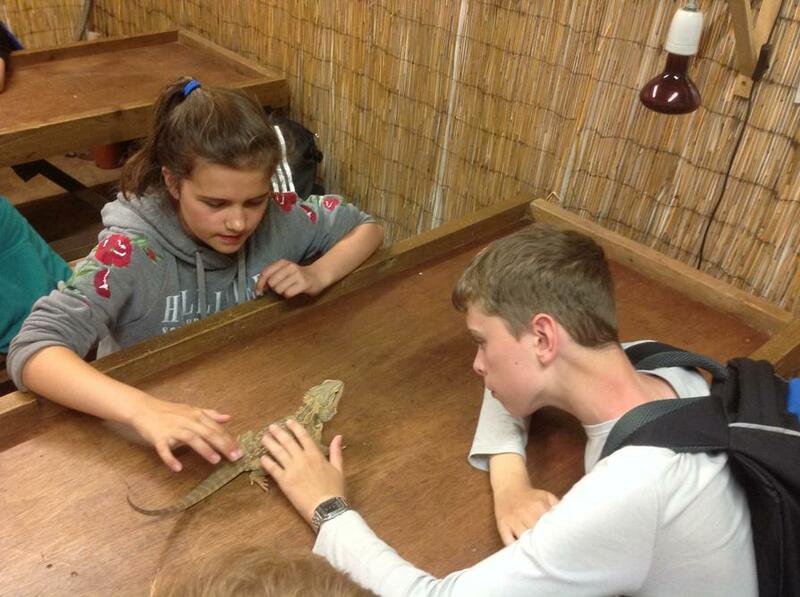 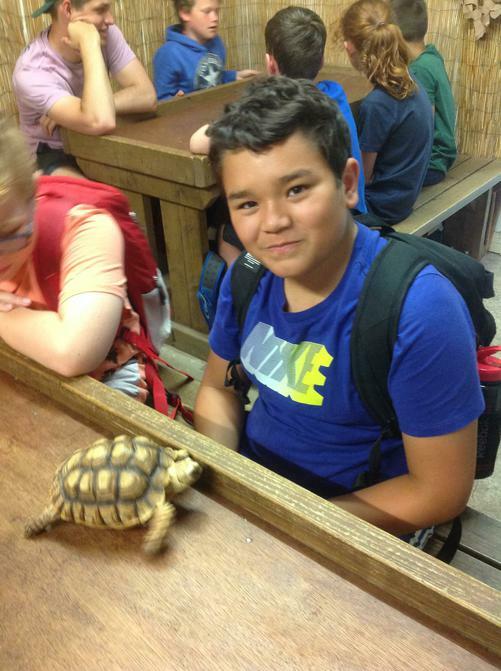 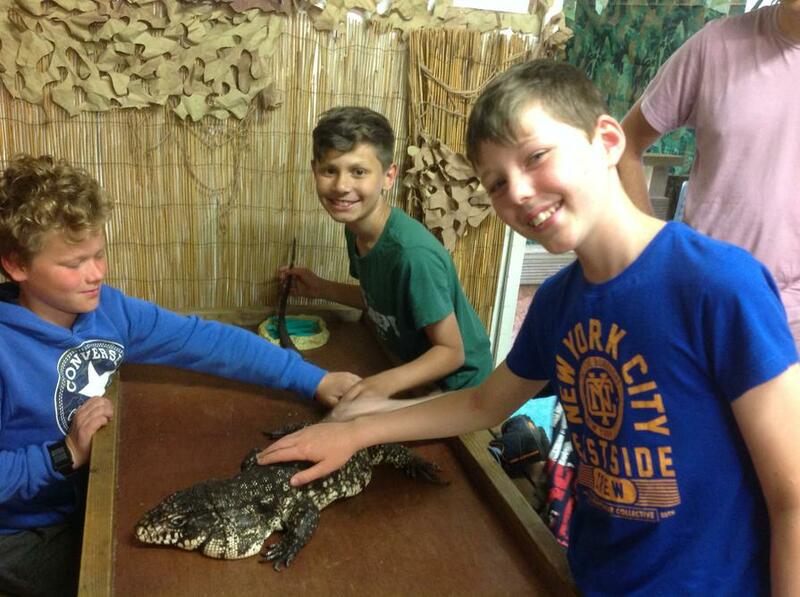 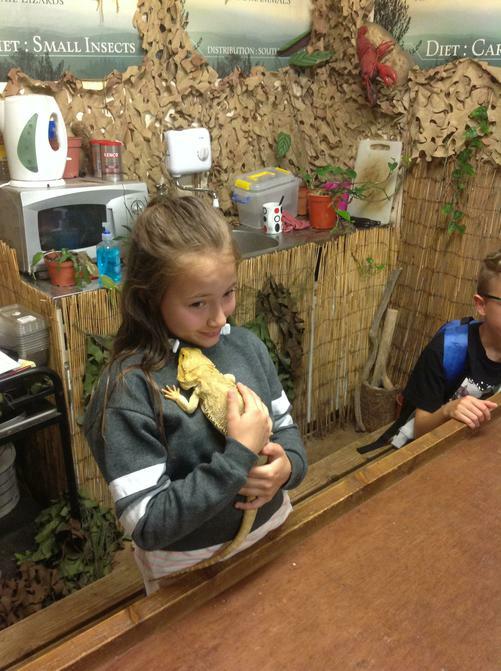 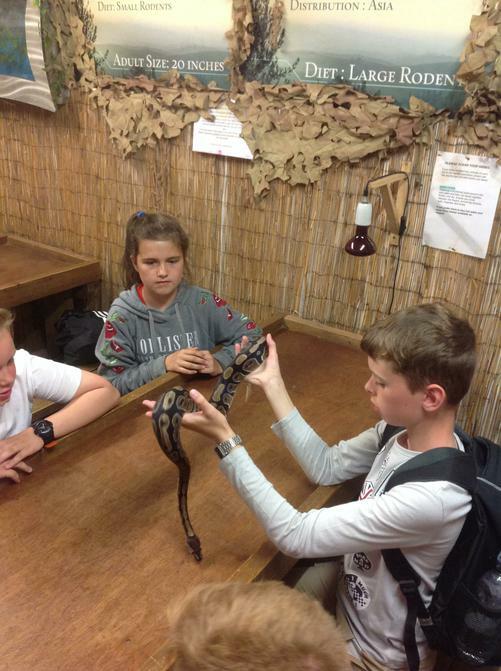 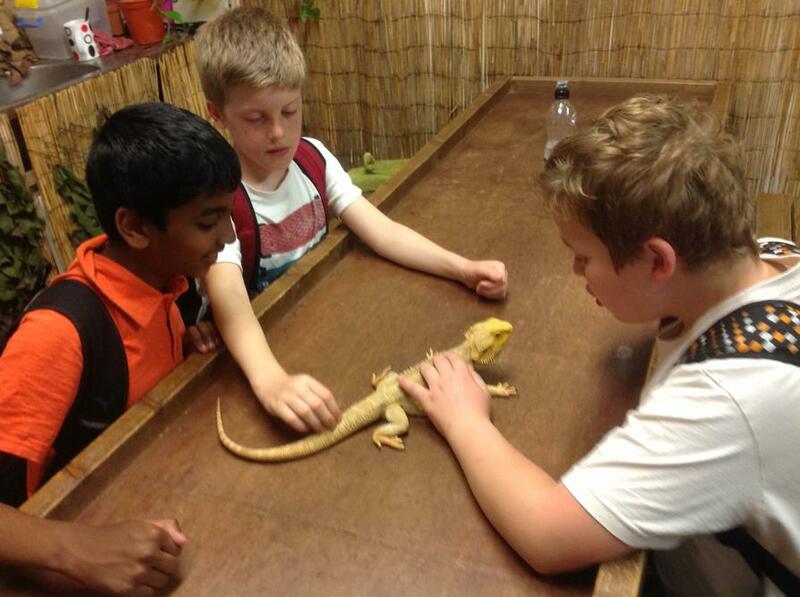 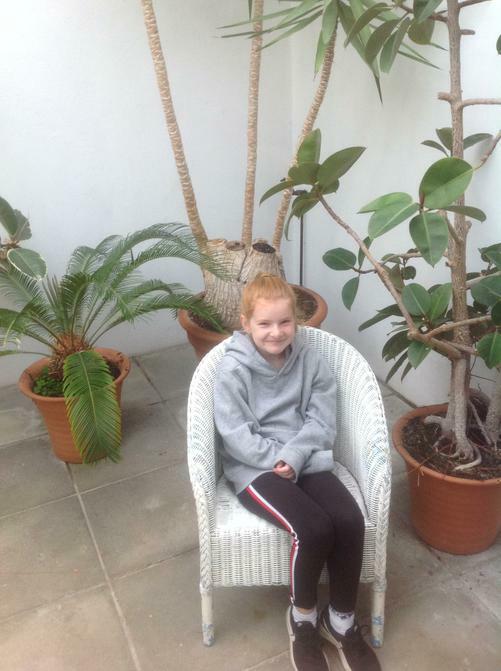 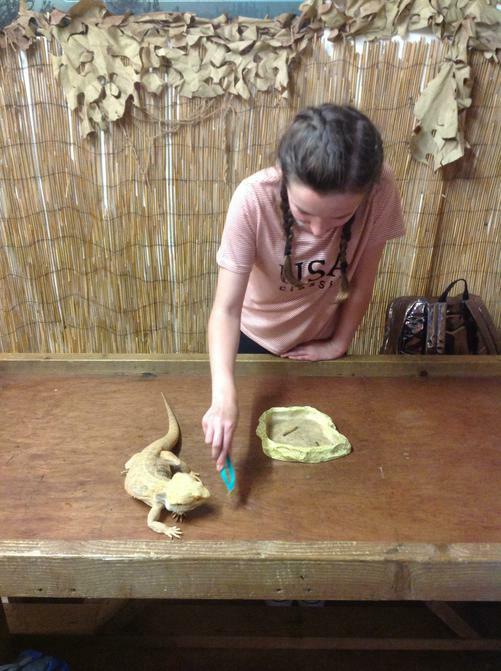 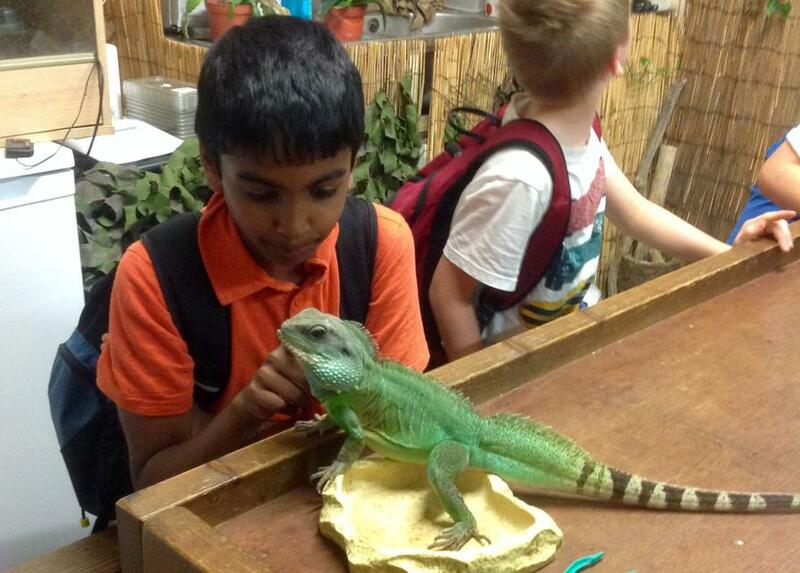 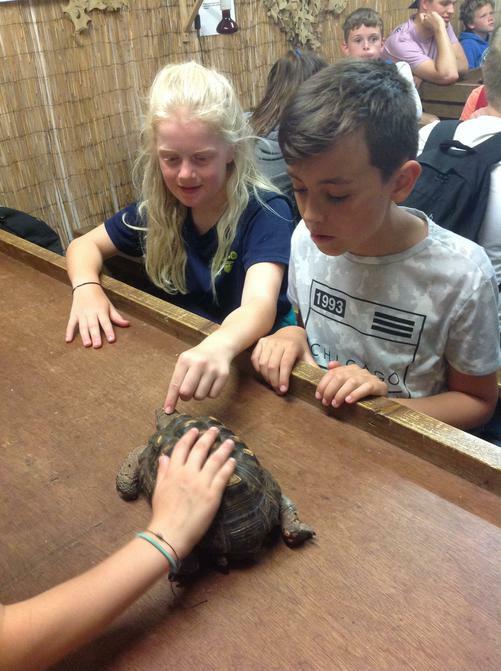 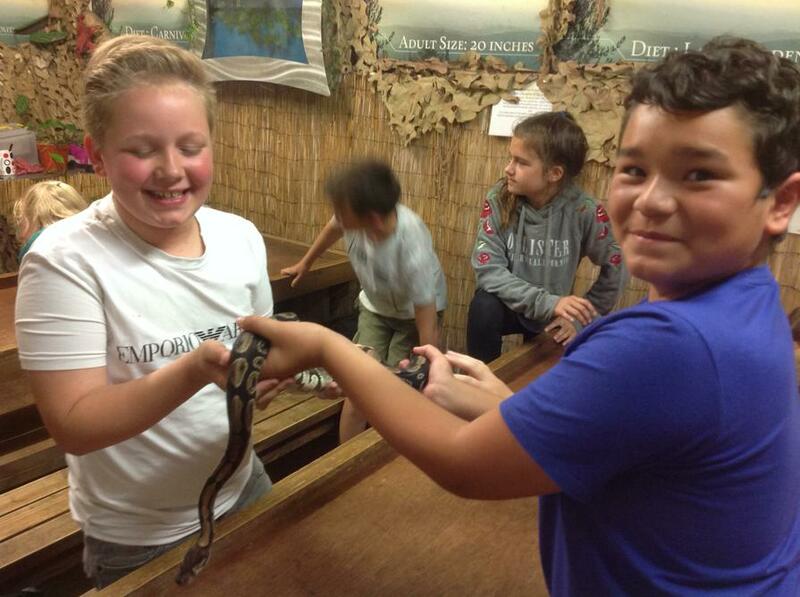 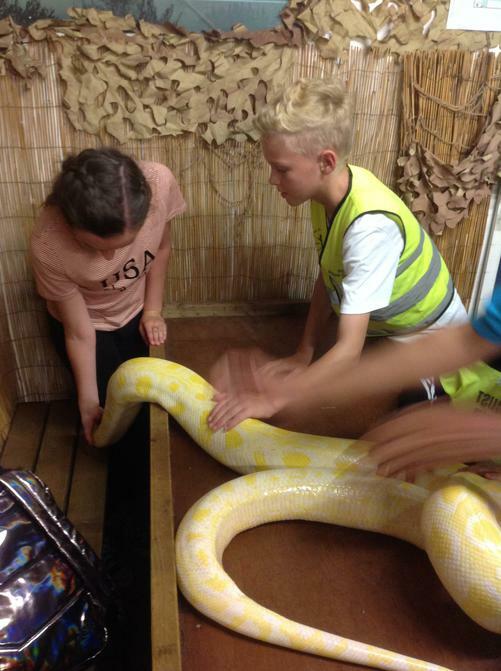 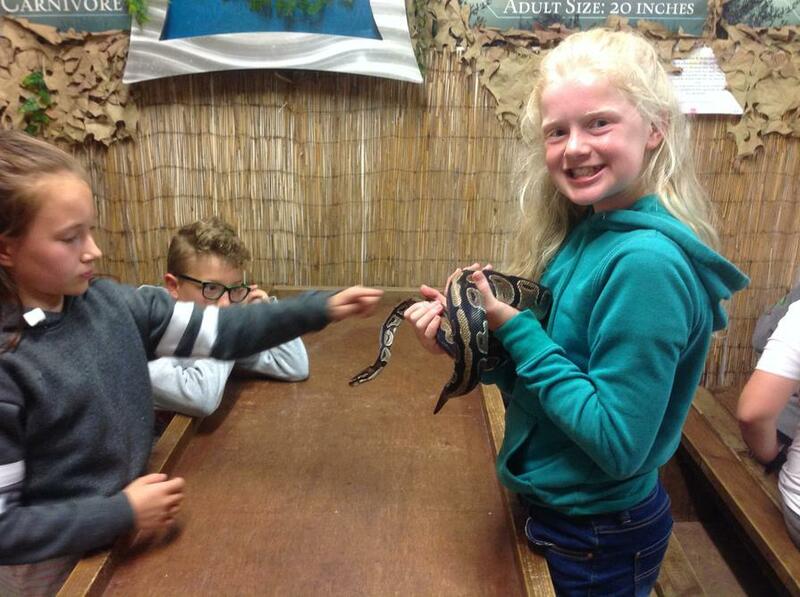 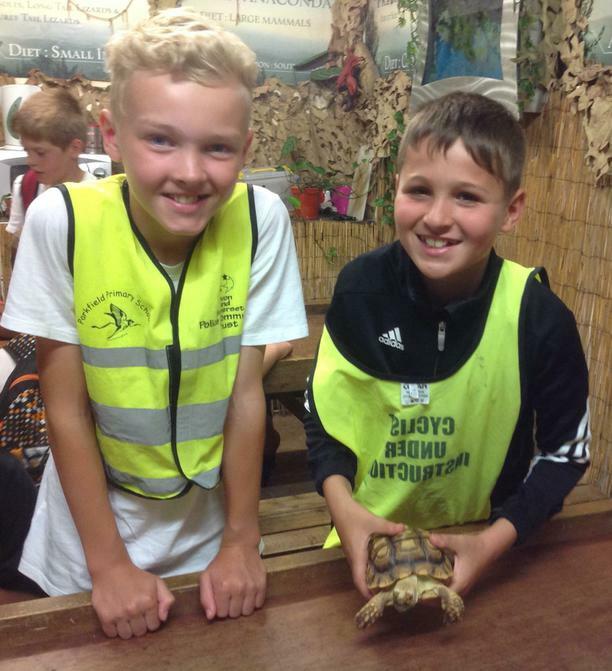 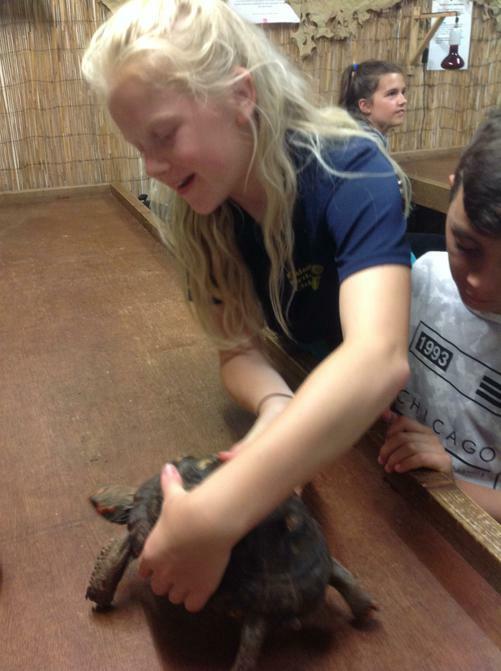 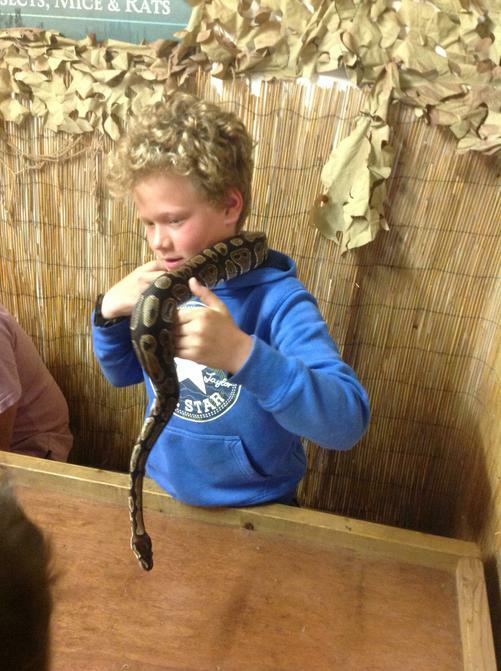 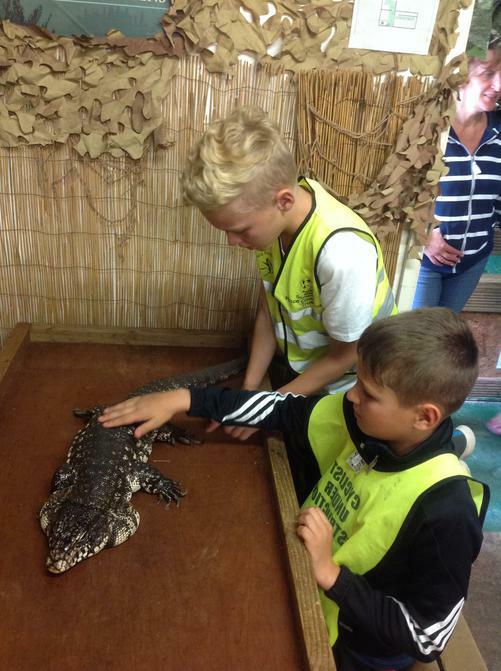 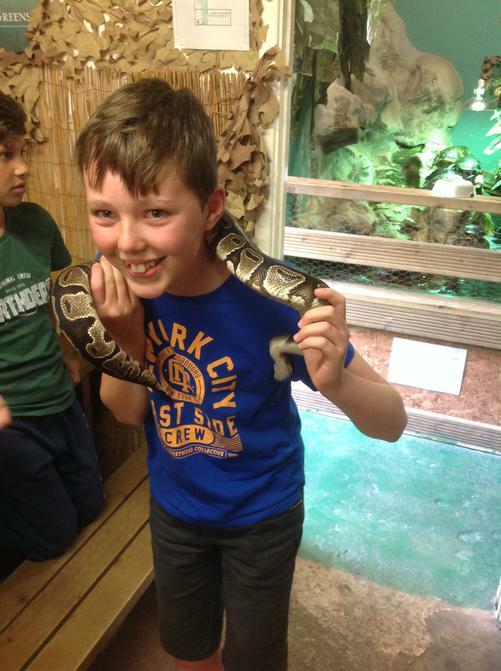 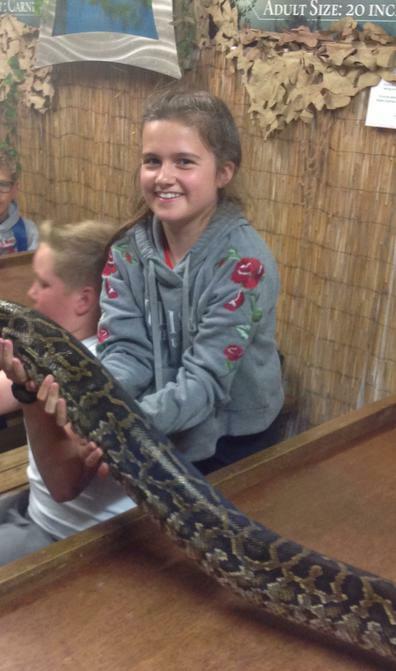 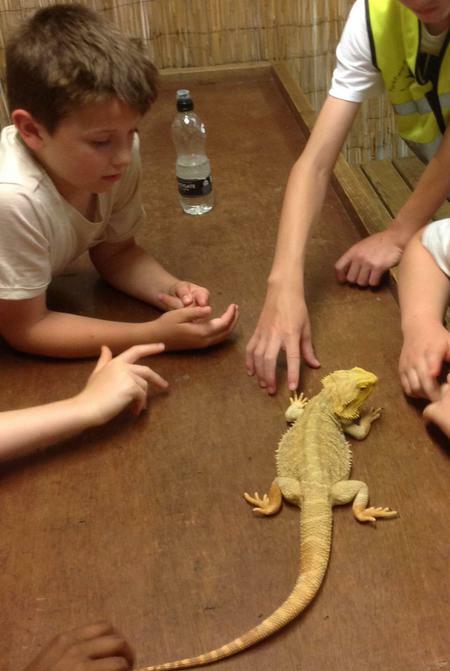 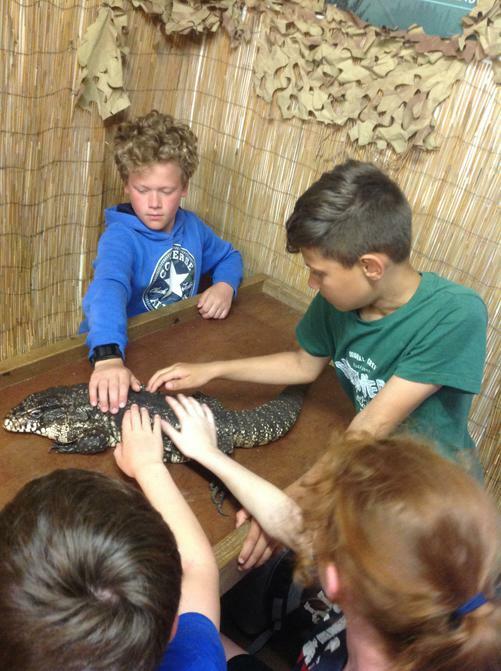 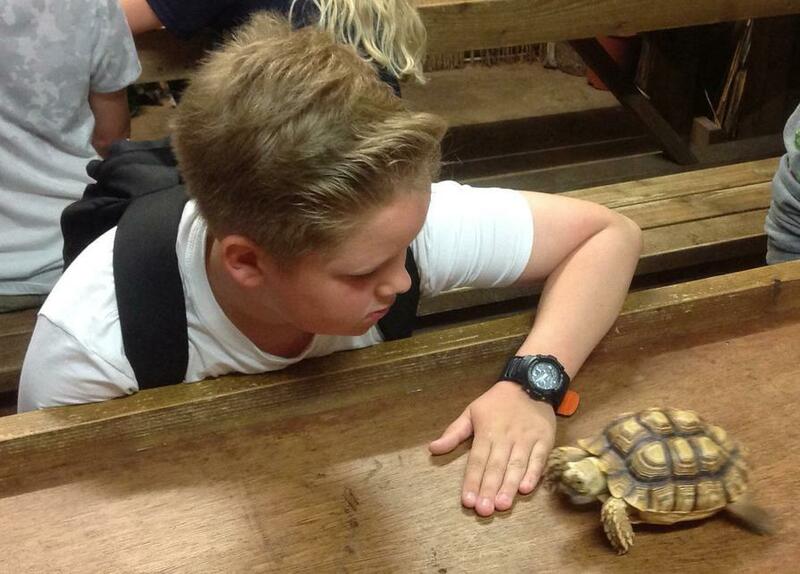 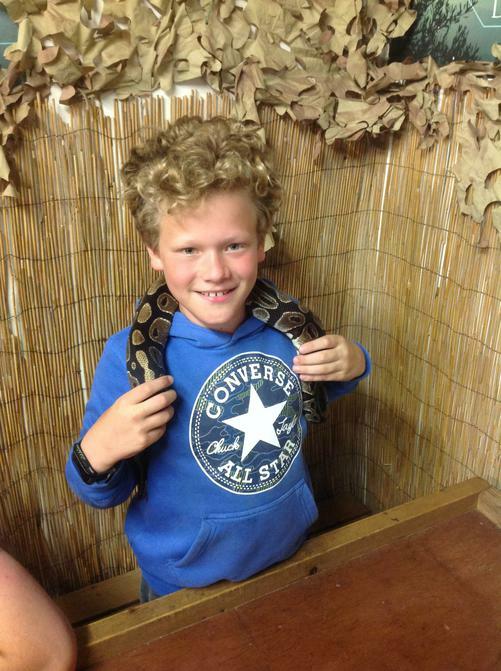 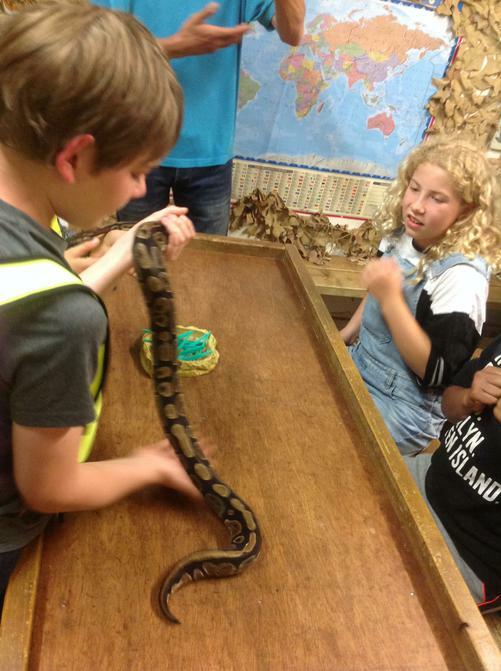 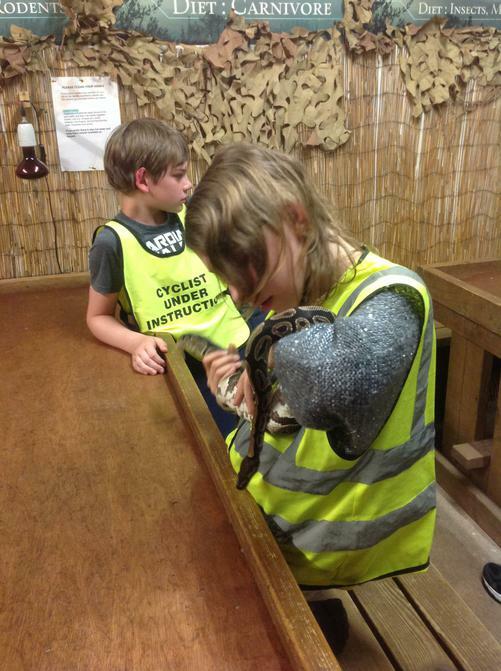 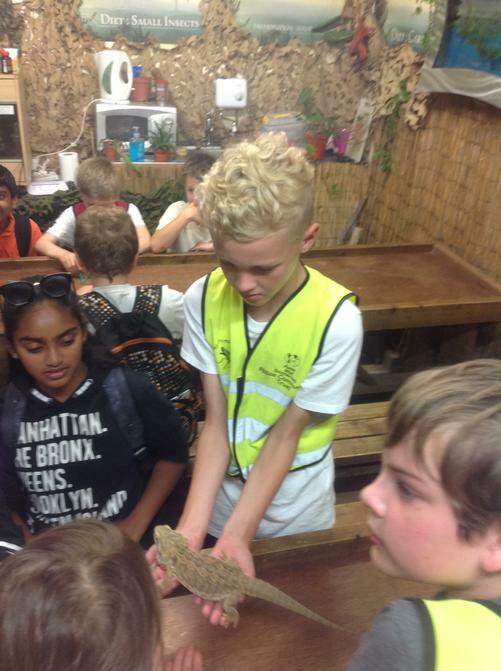 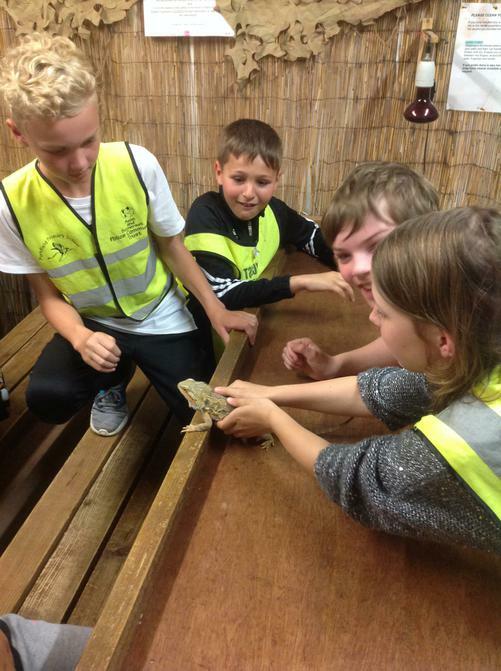 Some children visited the reptile centre and met all sorts of creatures including different snakes, iguanas, turtles, tortoises and bullfrogs. 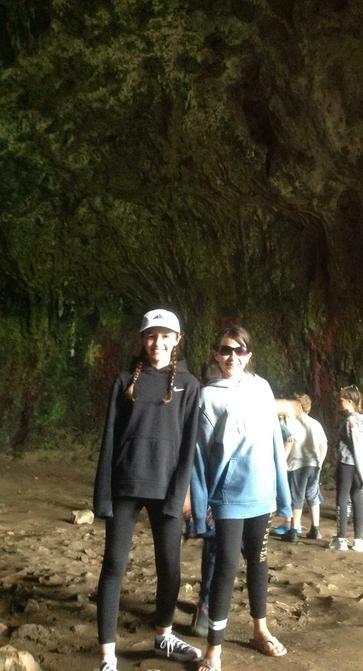 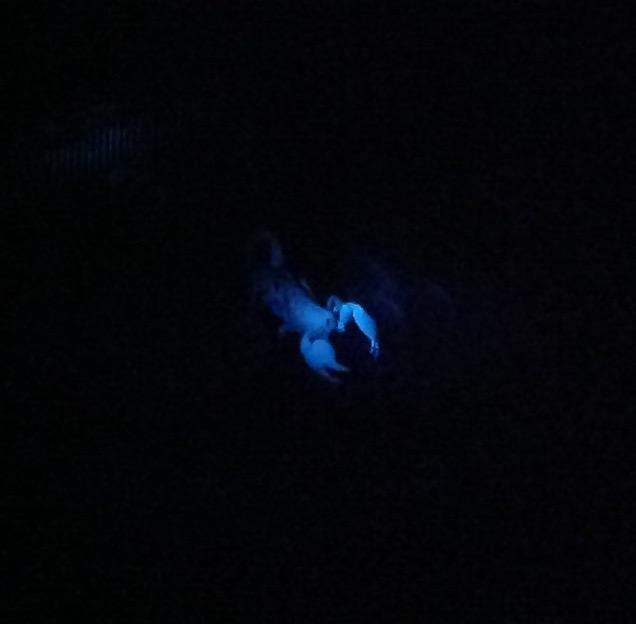 We also saw spiders and observed a scorpion under ultra-violet light. 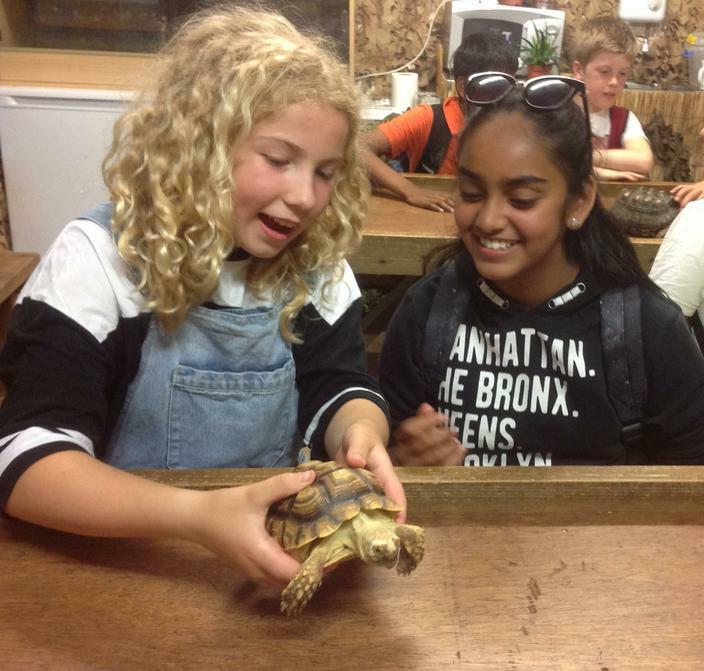 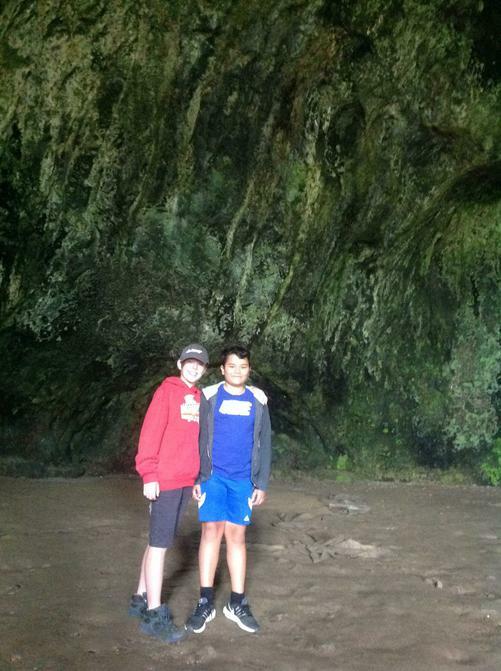 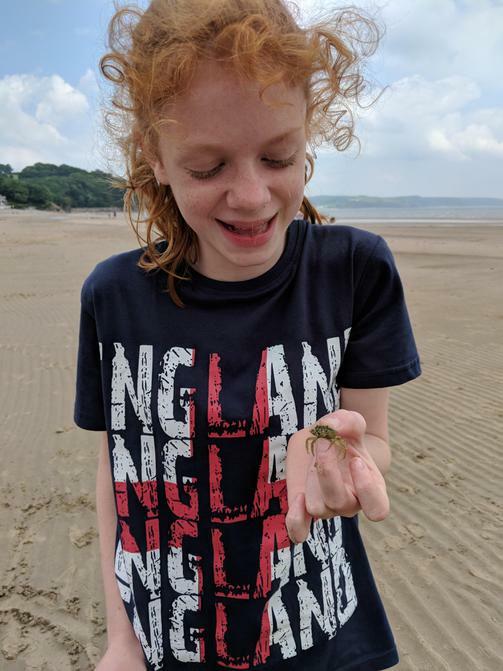 Several children recalled their learning about evolution through natural selection on the Galapagos Island as we met a blue tarantula, only discovered in 2012, which is uniquely found on one mountain in Brazil. 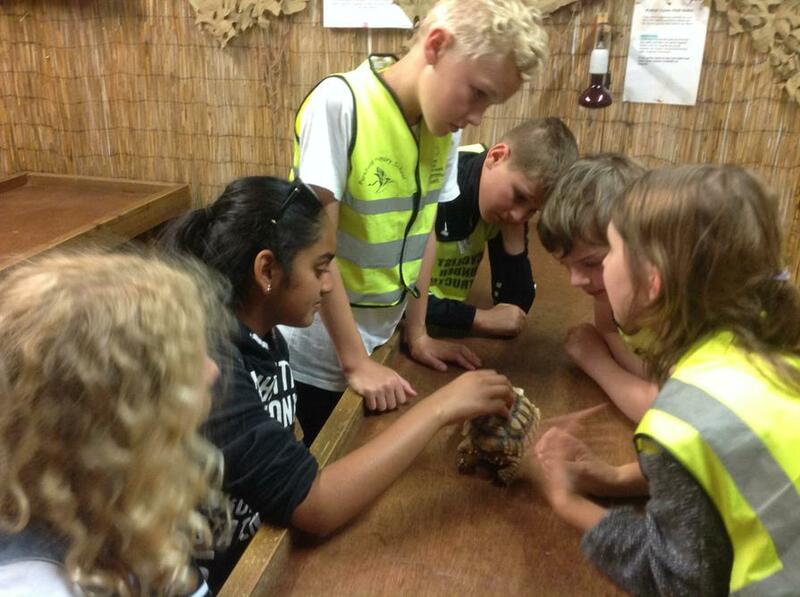 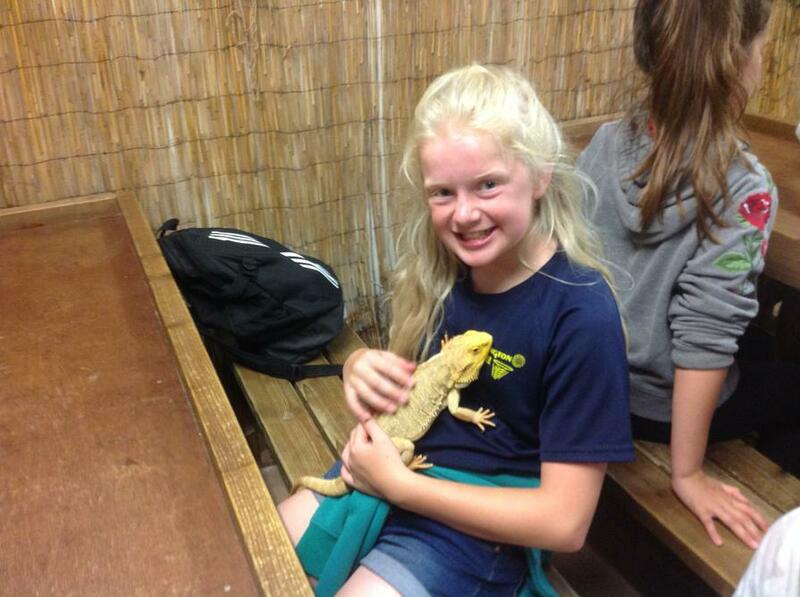 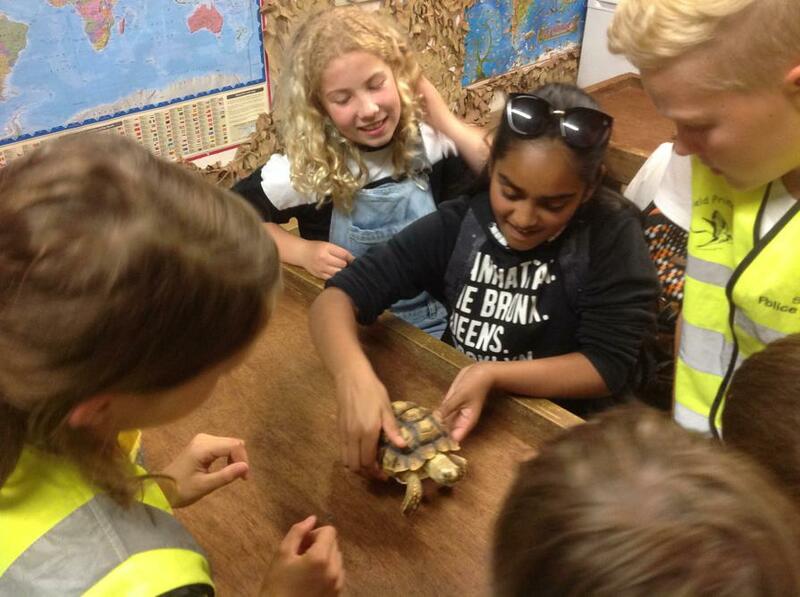 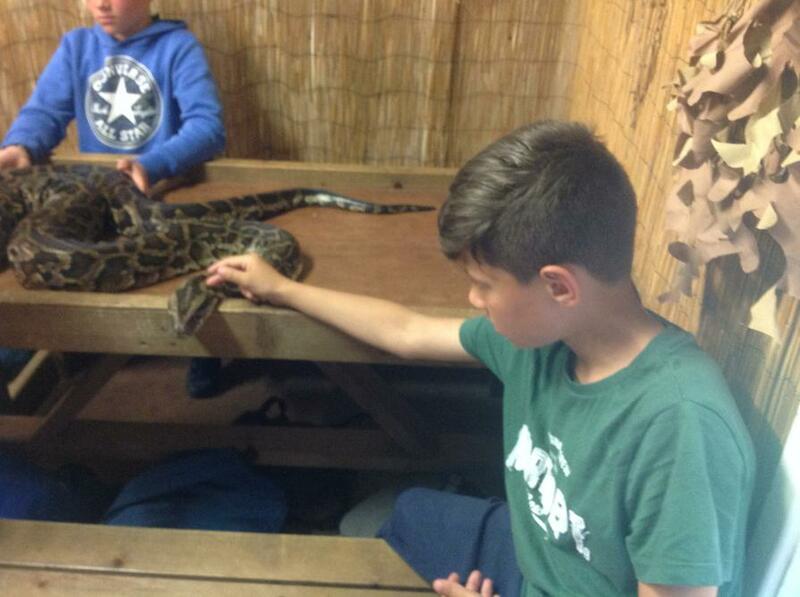 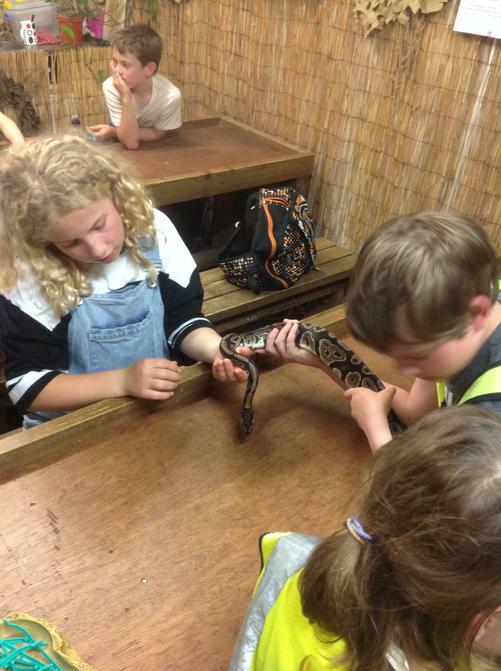 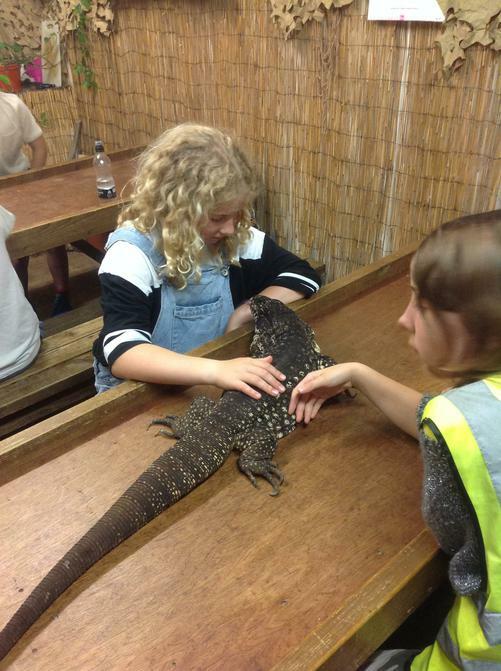 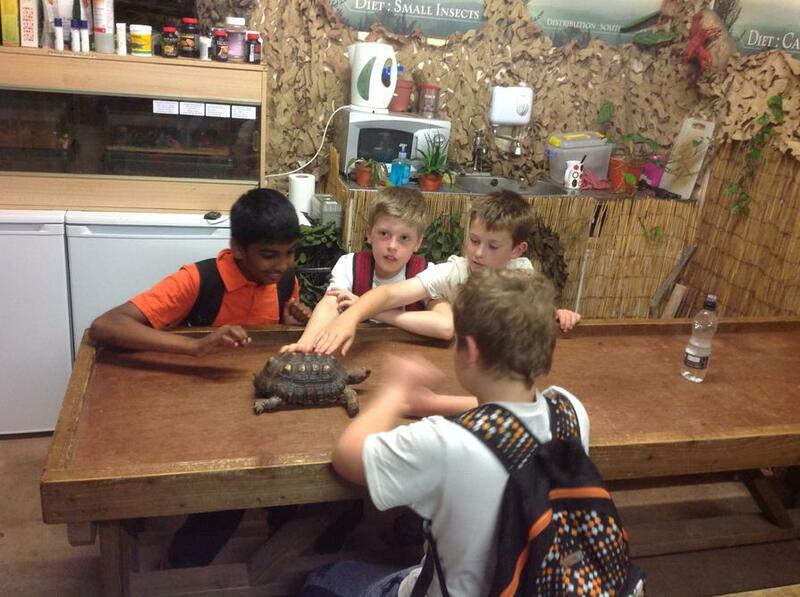 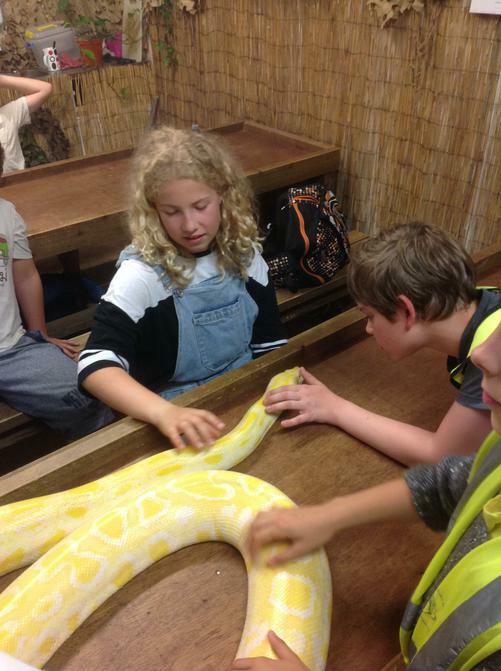 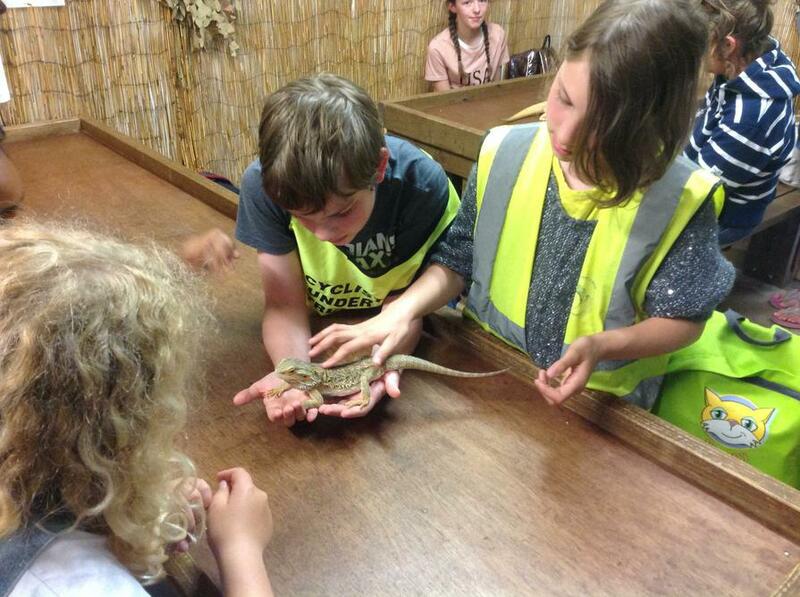 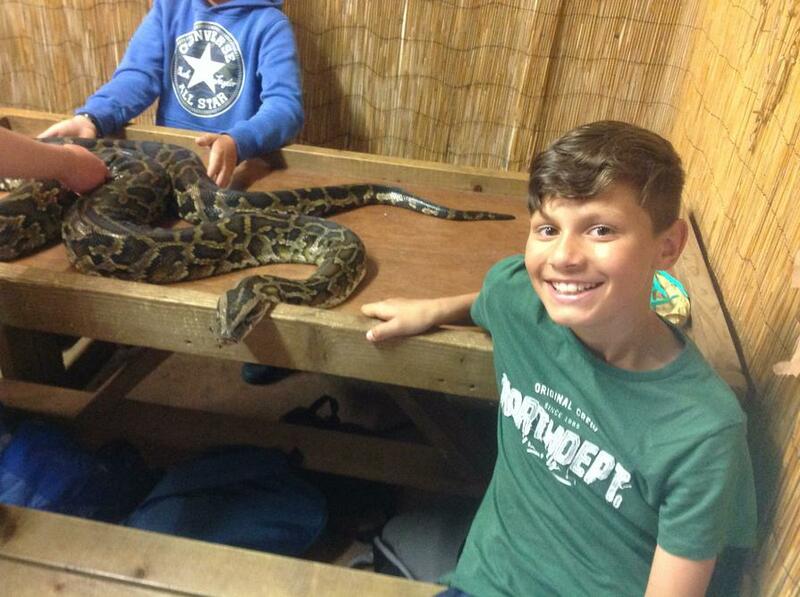 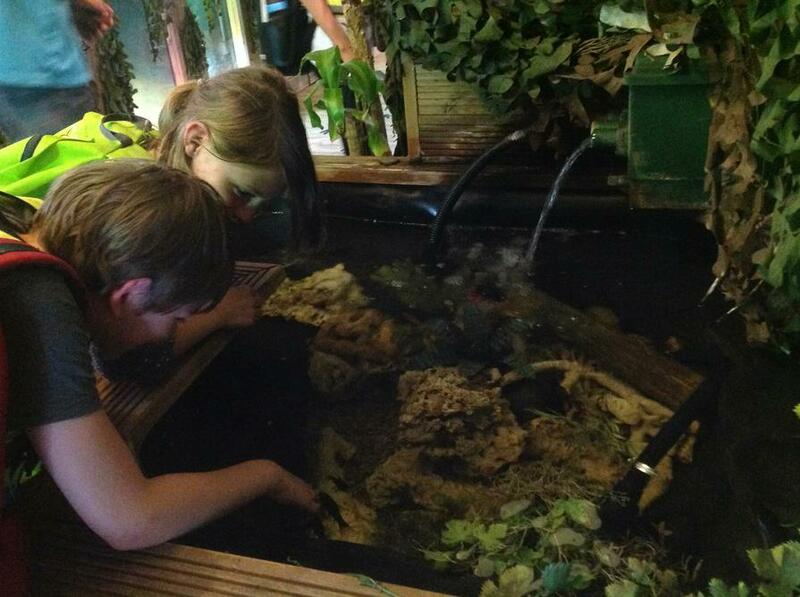 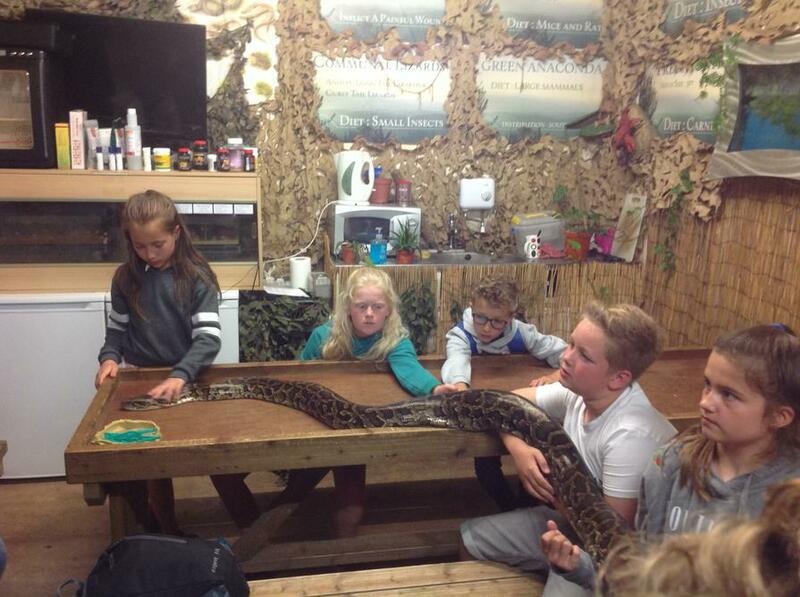 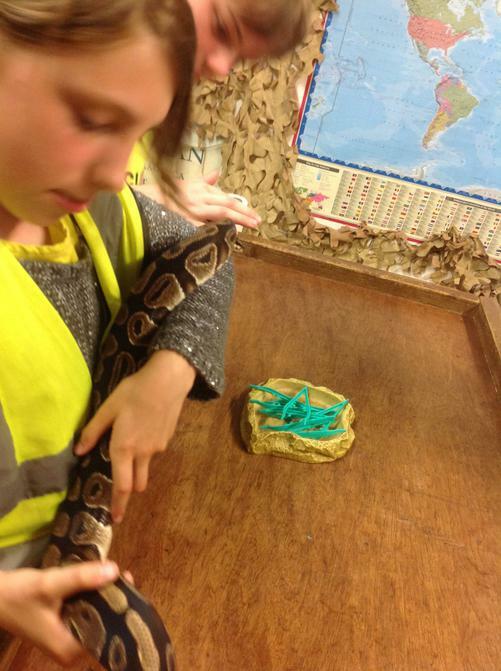 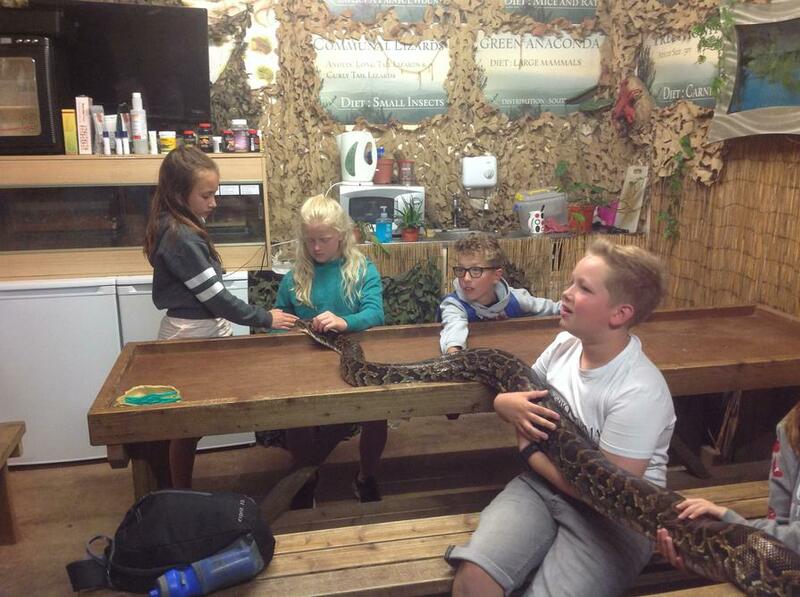 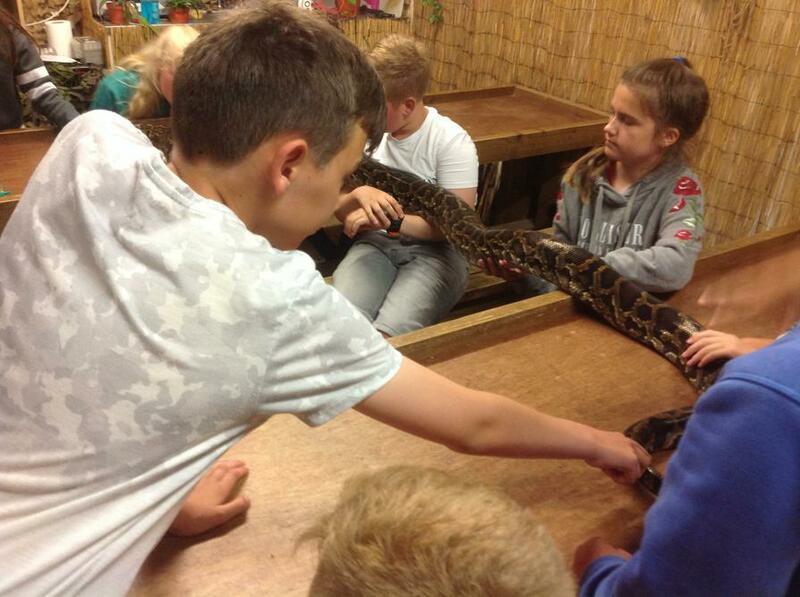 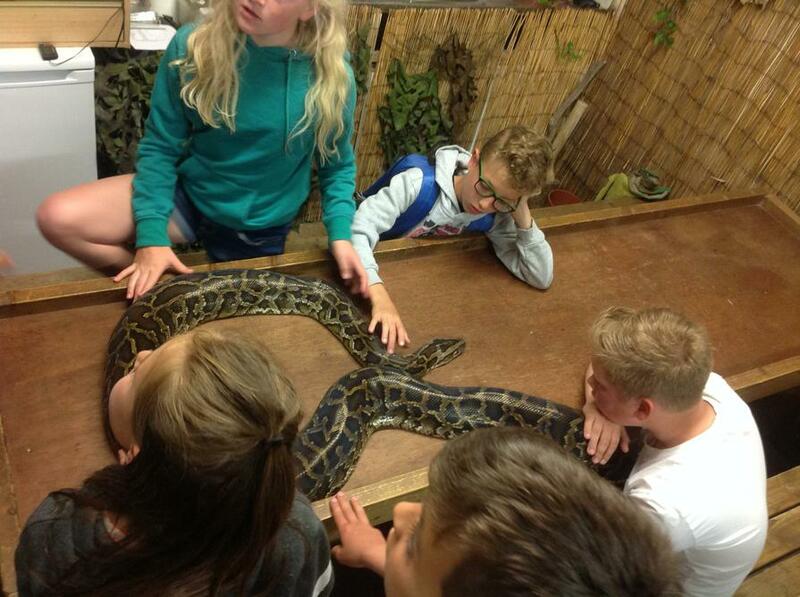 It was brilliant to see the children overcoming their fears and enjoying these marvellous animals. 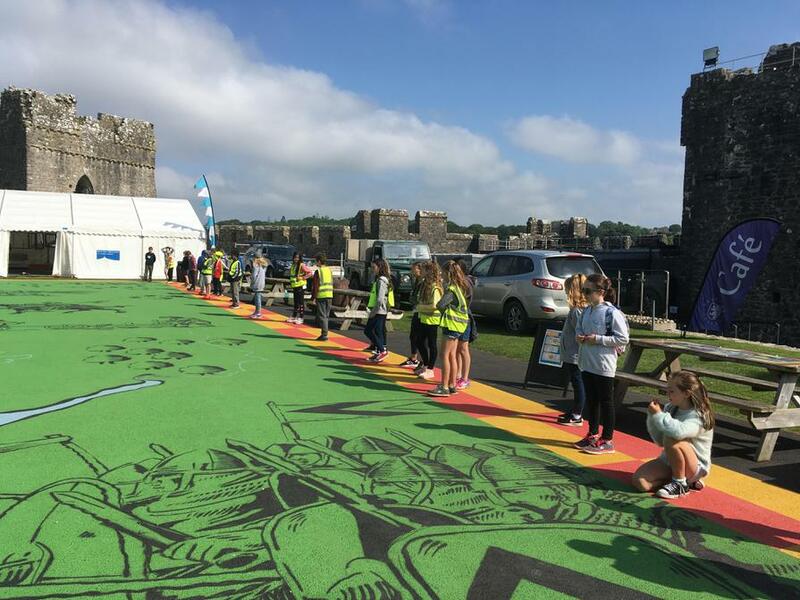 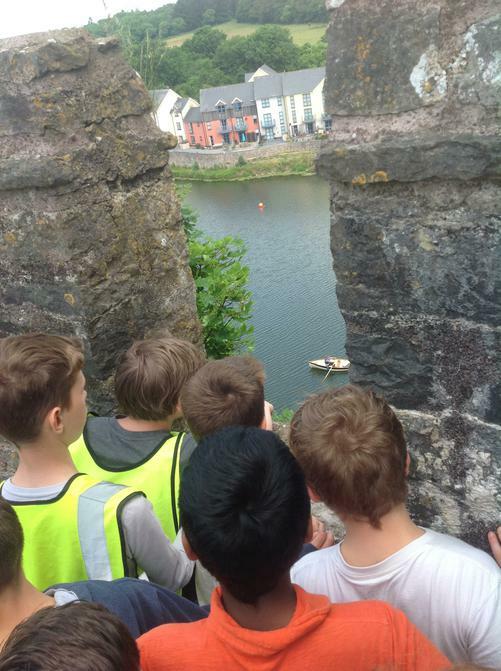 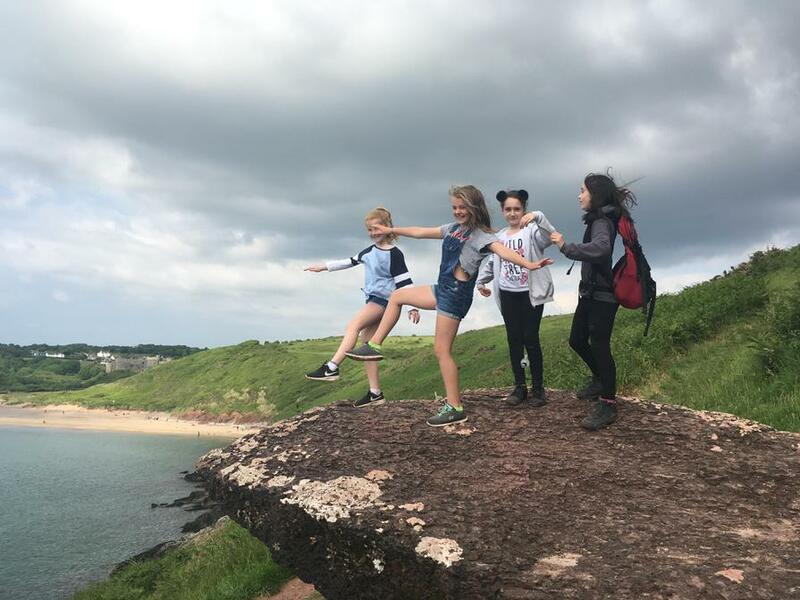 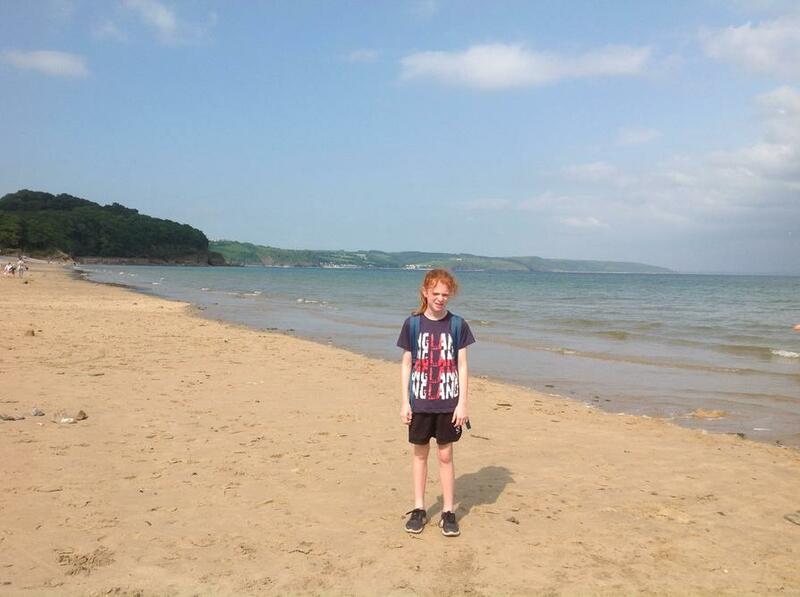 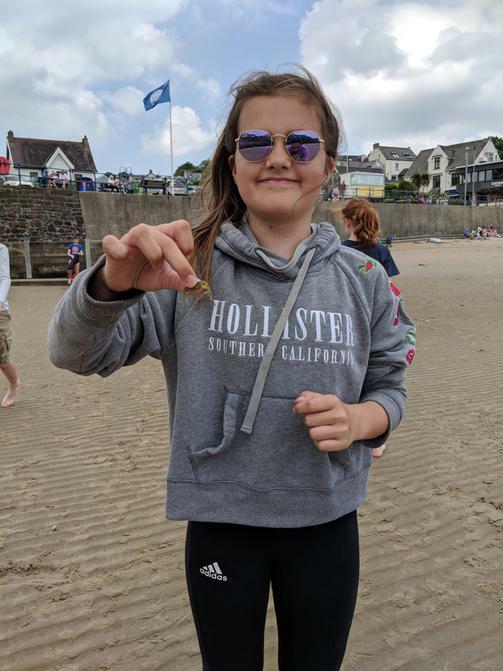 While not in the reptile centre, this group enjoyed time to paddle and enjoy beach games in Saundersfoot. 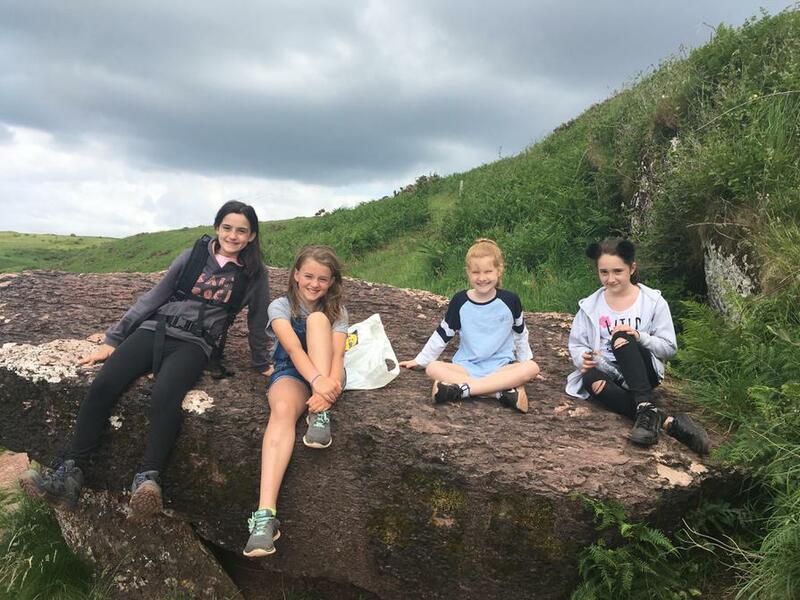 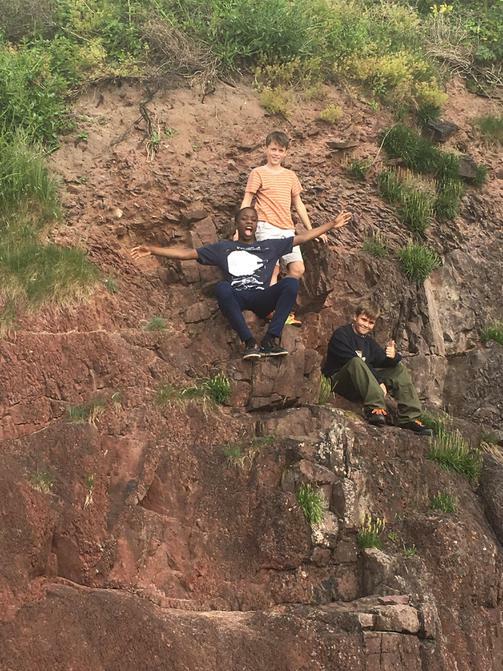 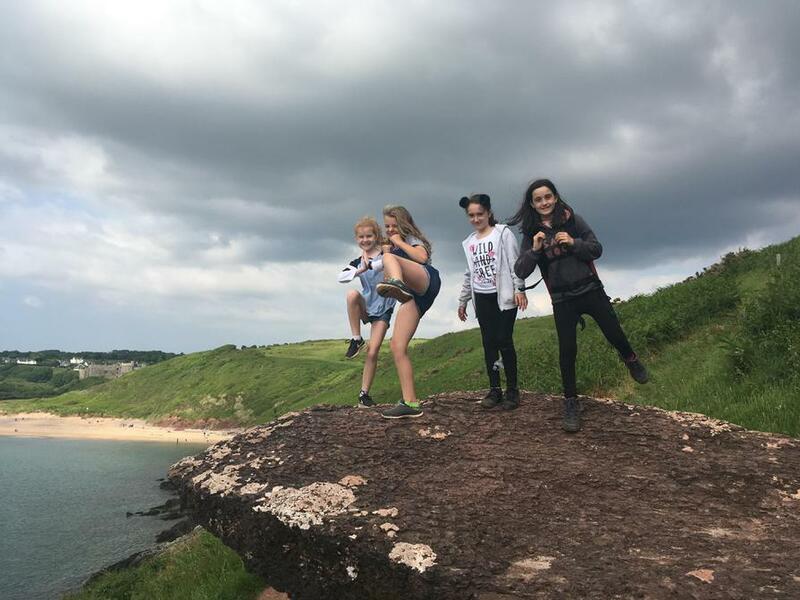 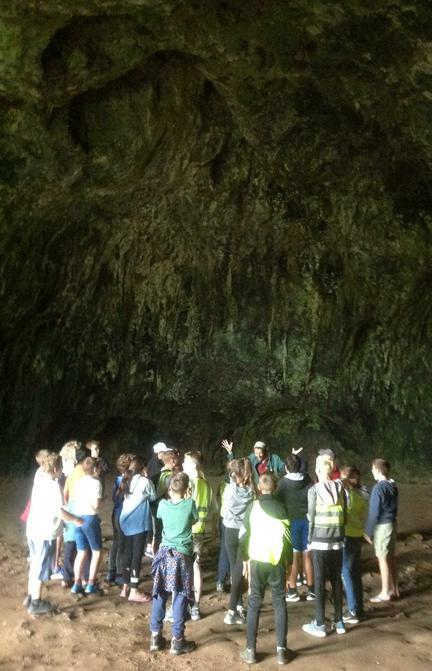 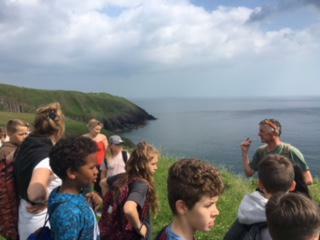 Meanwhile, another group enjoyed a firelighting demonstration and took in the scenery along an amazing scenic walk. 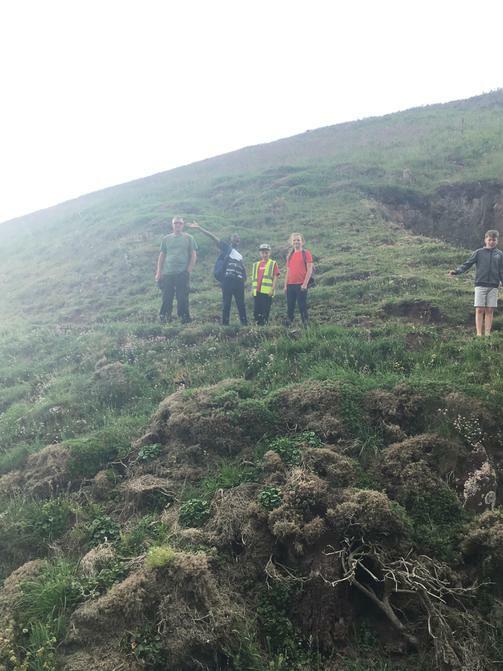 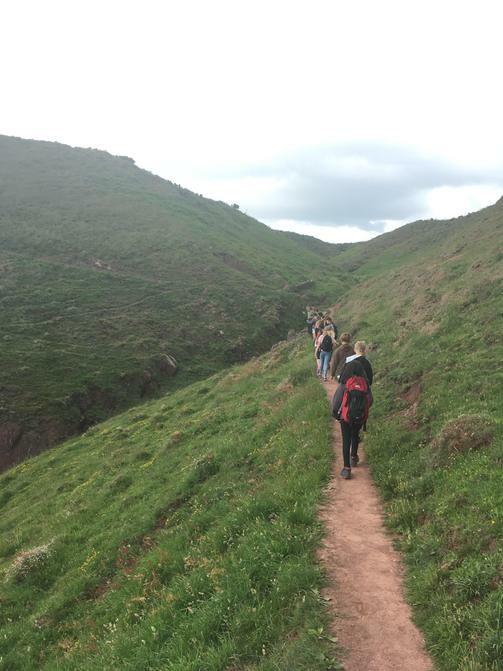 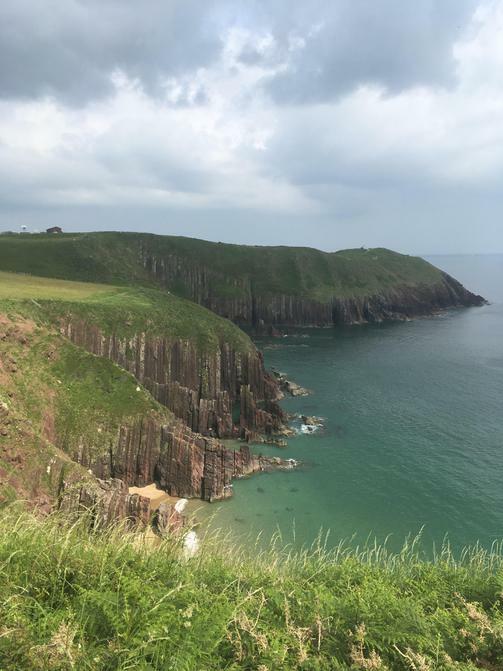 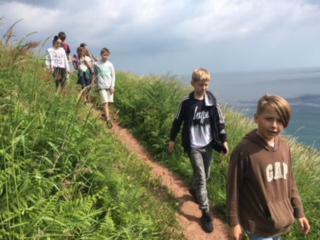 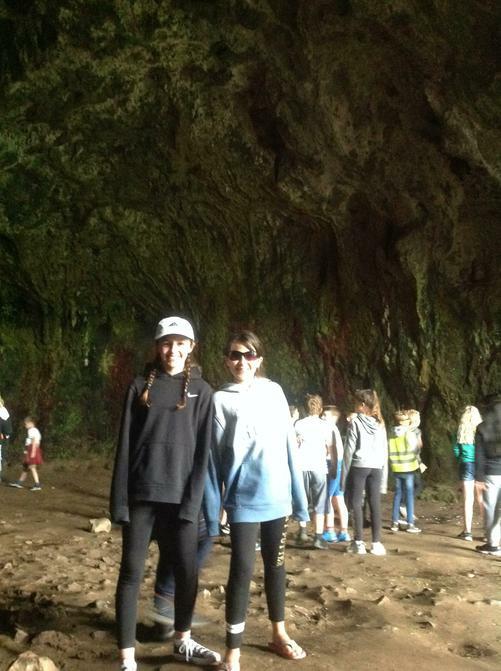 Despite tired feet, the children agreed that it was an amazing scenic route. 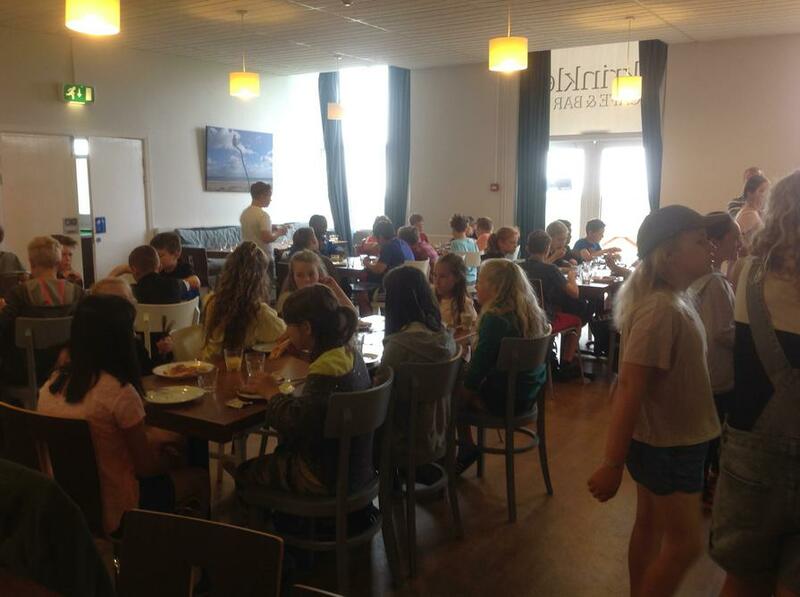 After dinner, the children had a chance to update diaries and many were ready for bed quite quickly! 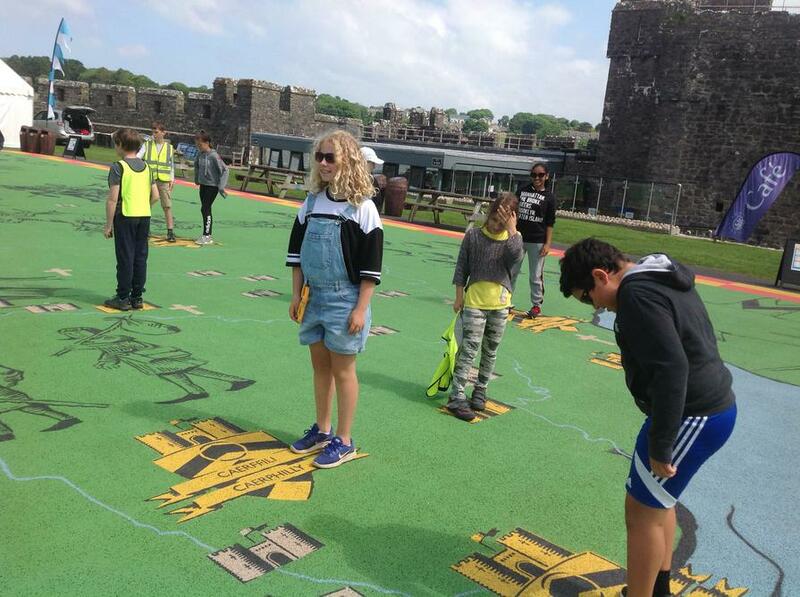 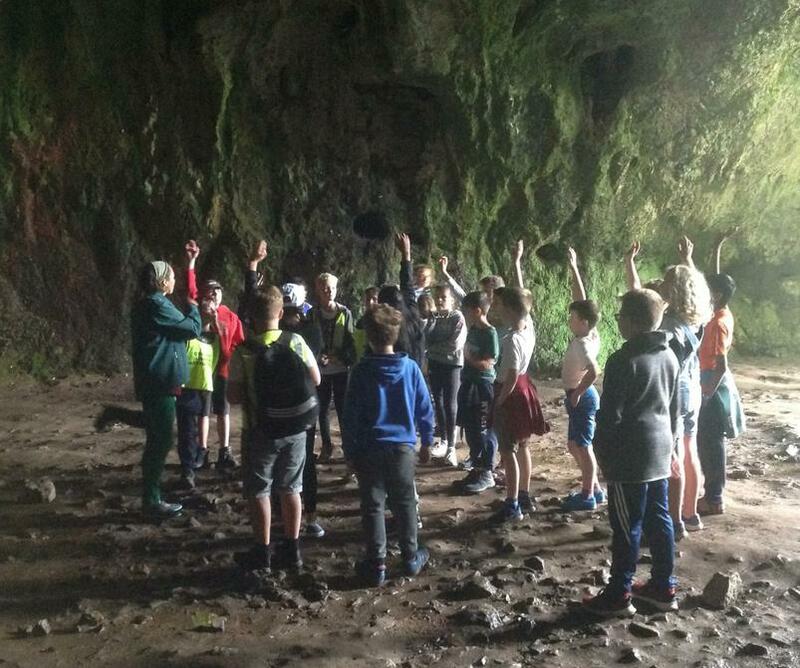 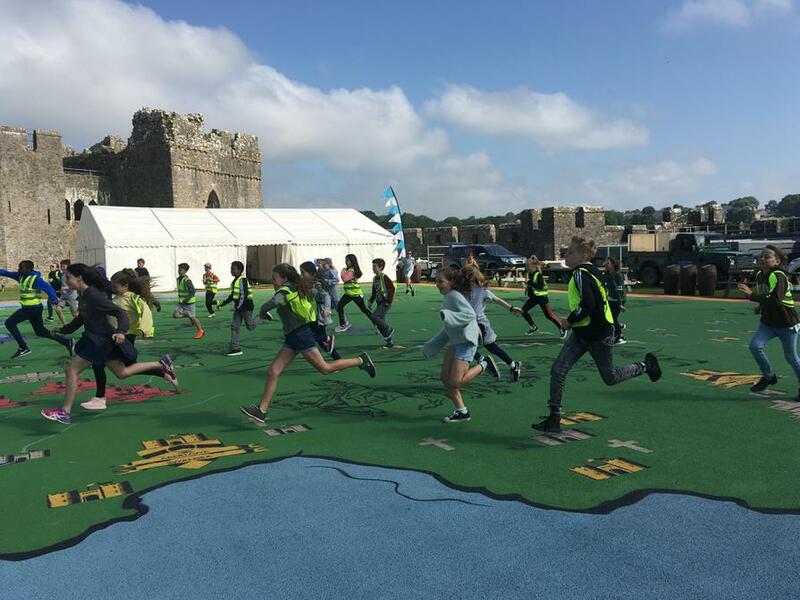 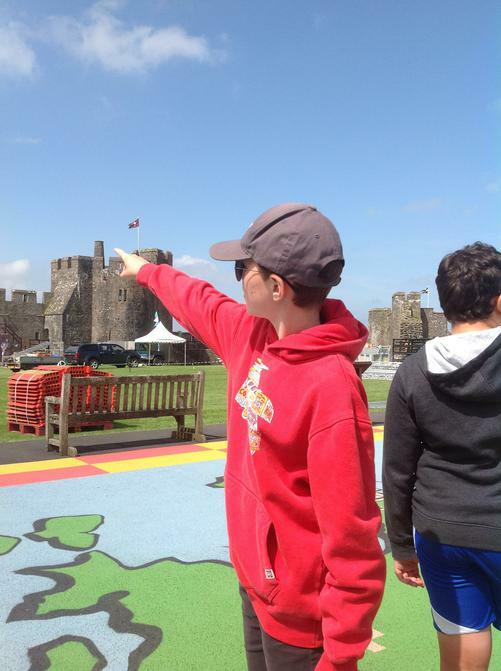 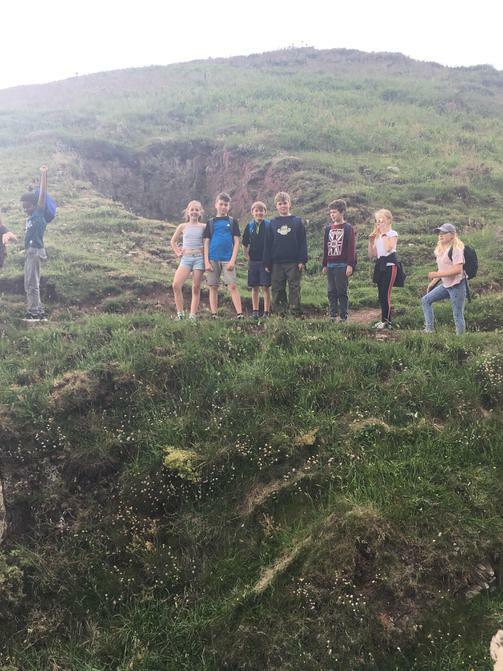 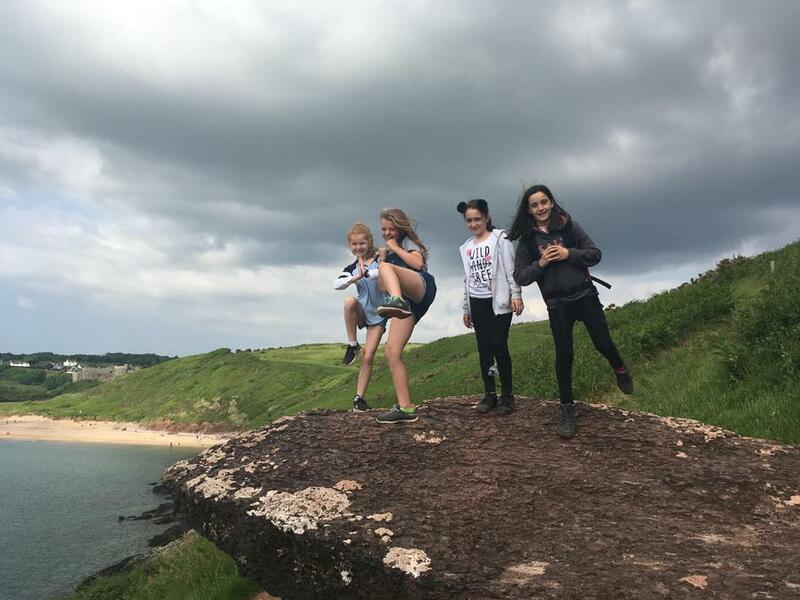 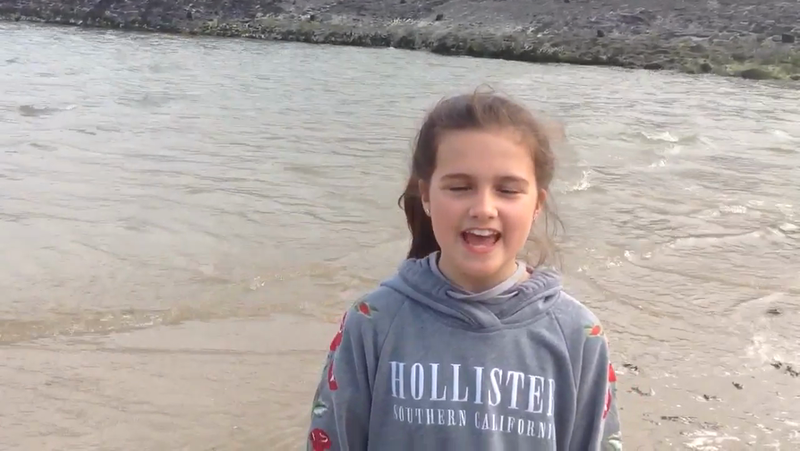 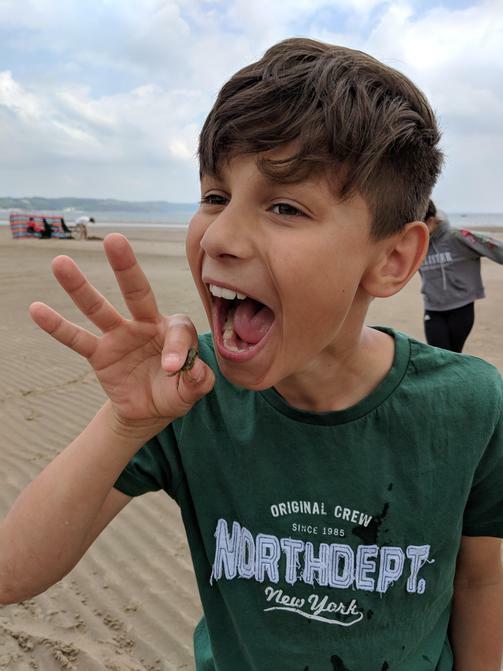 Due to the forecast of high winds on Thursday, our itinerary has changed slightly and tomorrow morning the children will enjoy a boat trip while on Thursday they will visit Folly Farm. 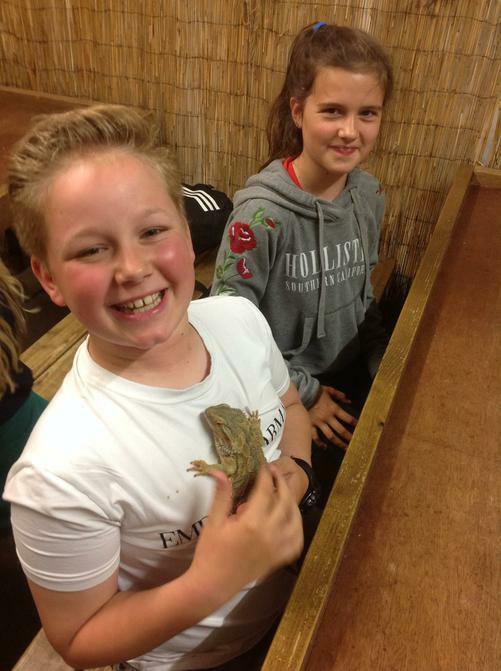 More updates tomorrow!